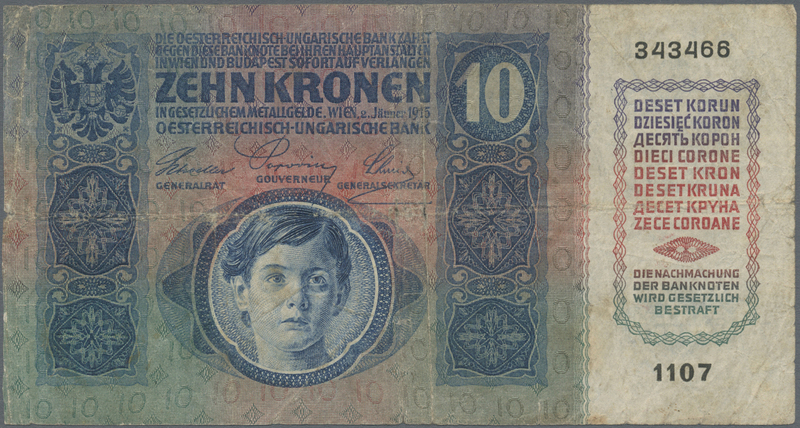 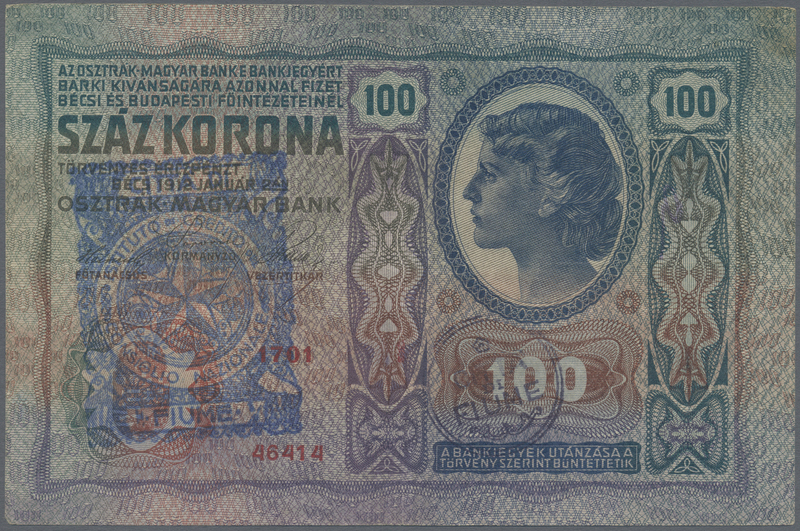 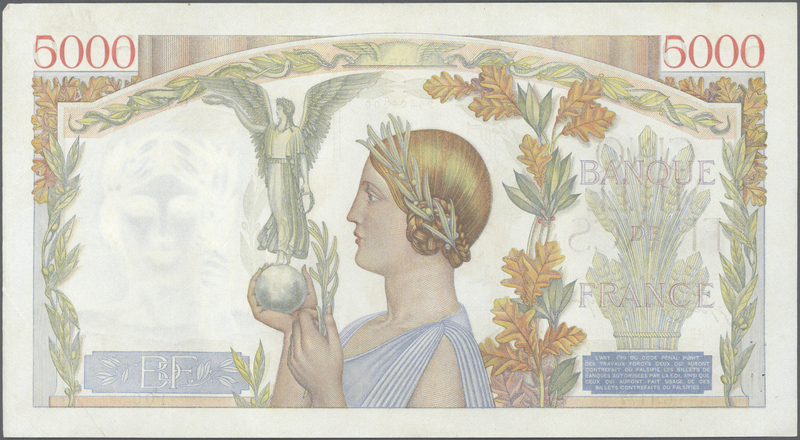 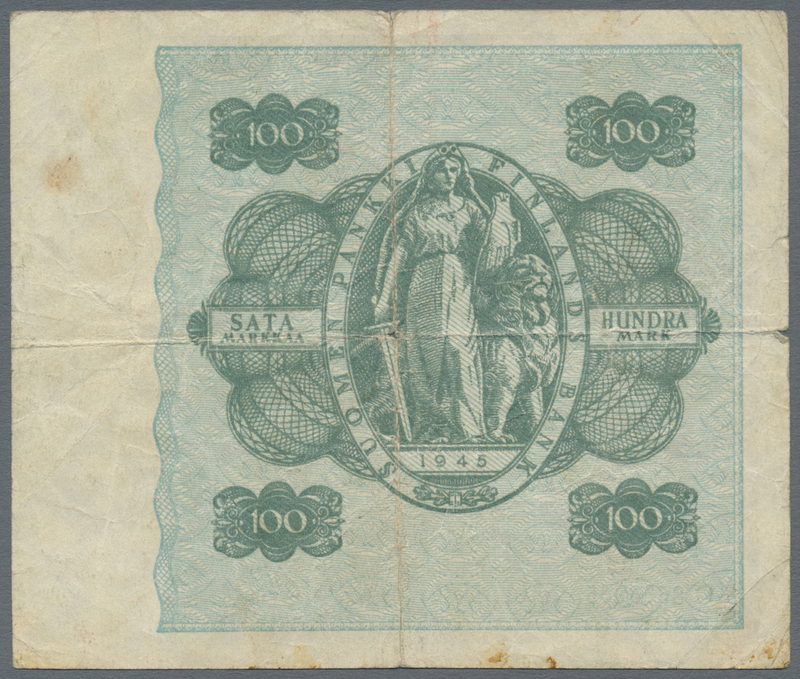 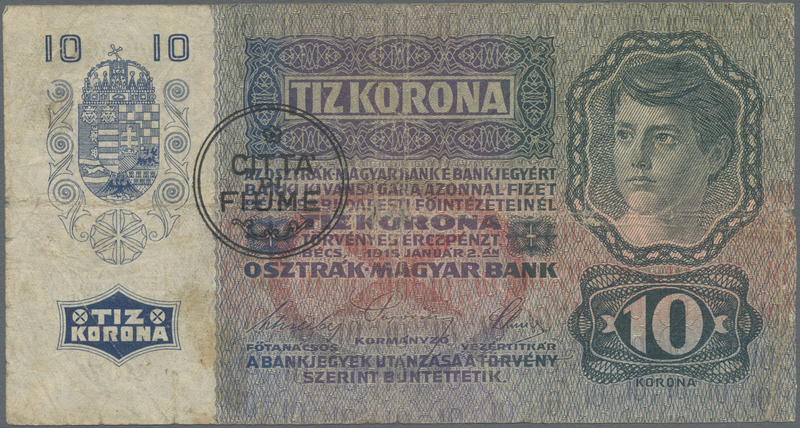 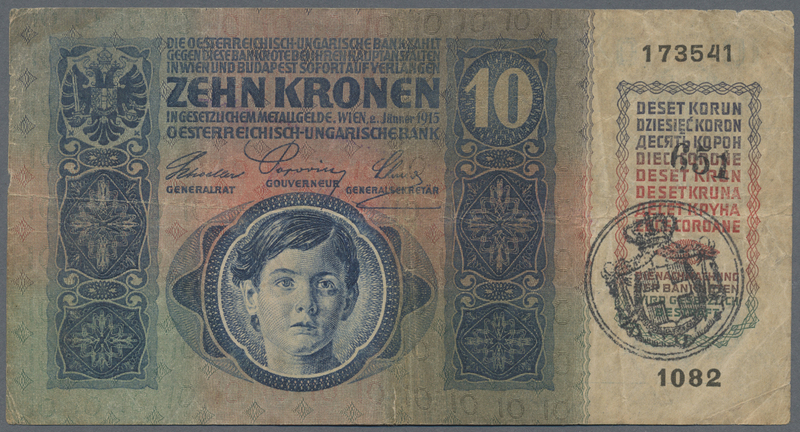 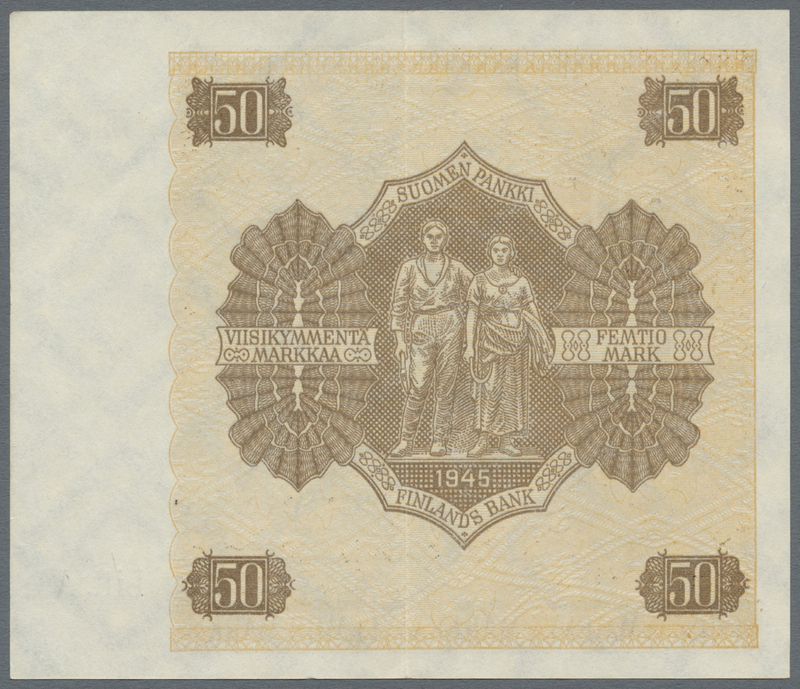 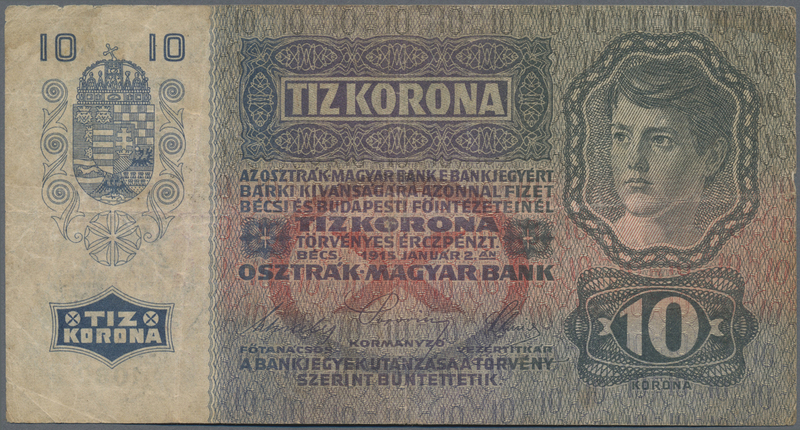 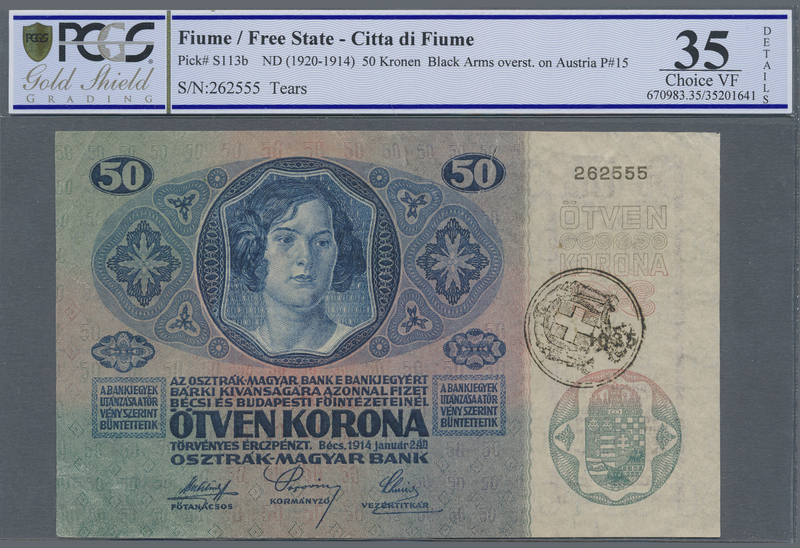 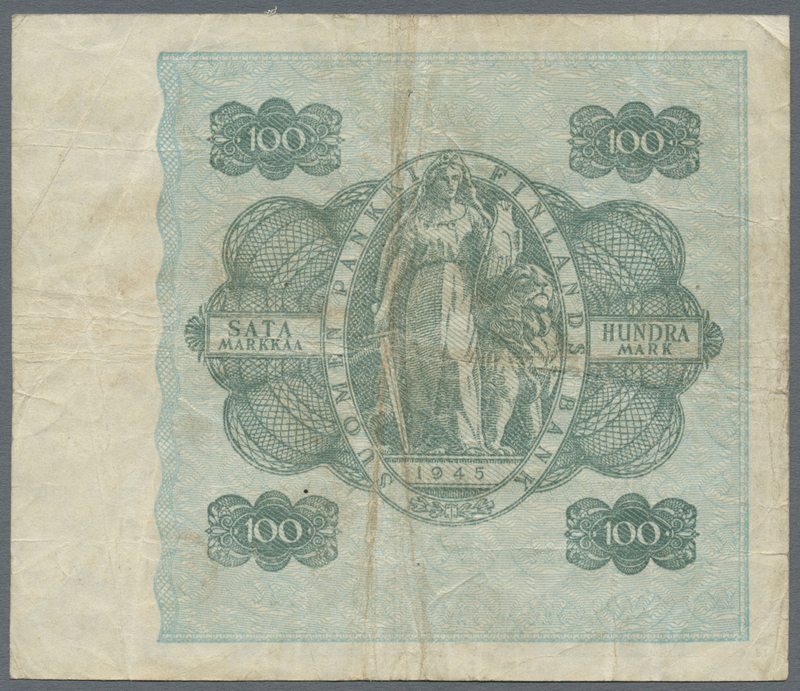 1436 Pick NL 100 Korona 1912 Austria-Hungary with overprint "Fiume" at left, used with light vertical and horizontal folds in paper, no holes or tears, original colors, strongness in paper, condition: VF-. 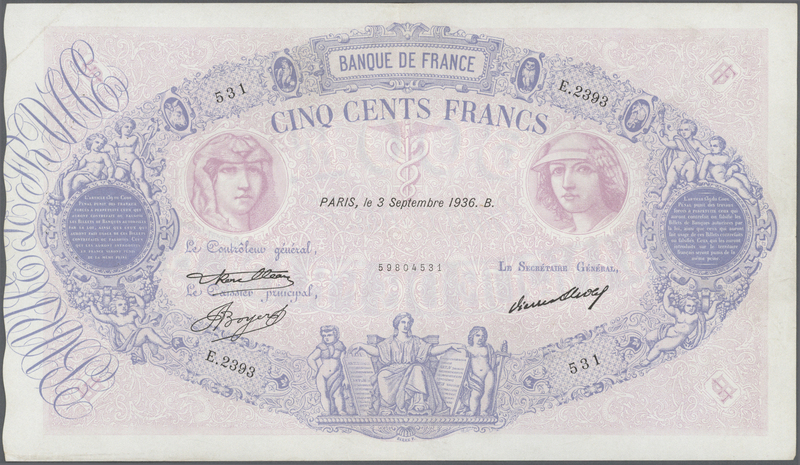 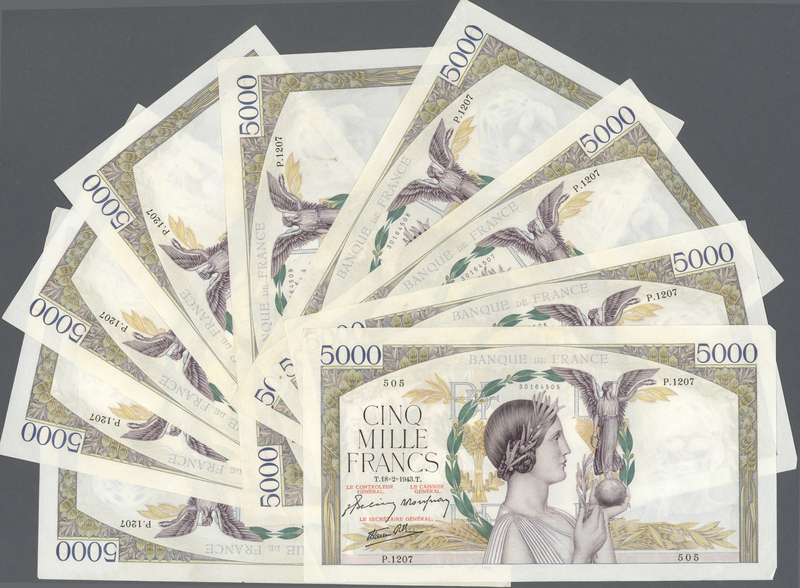 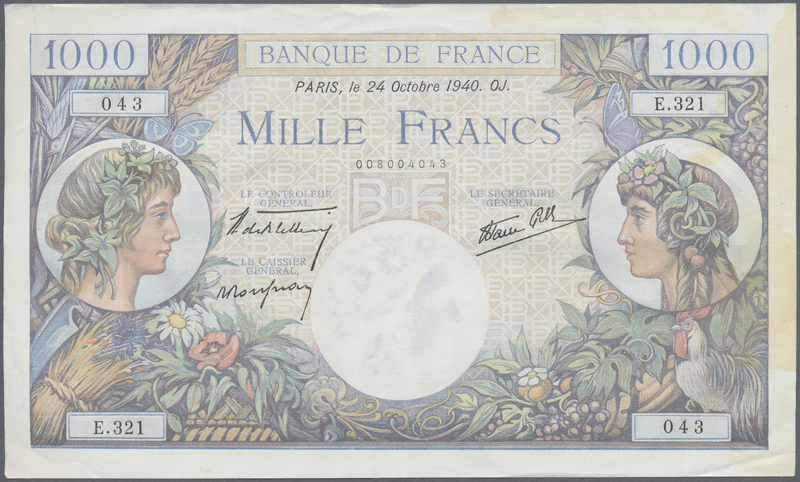 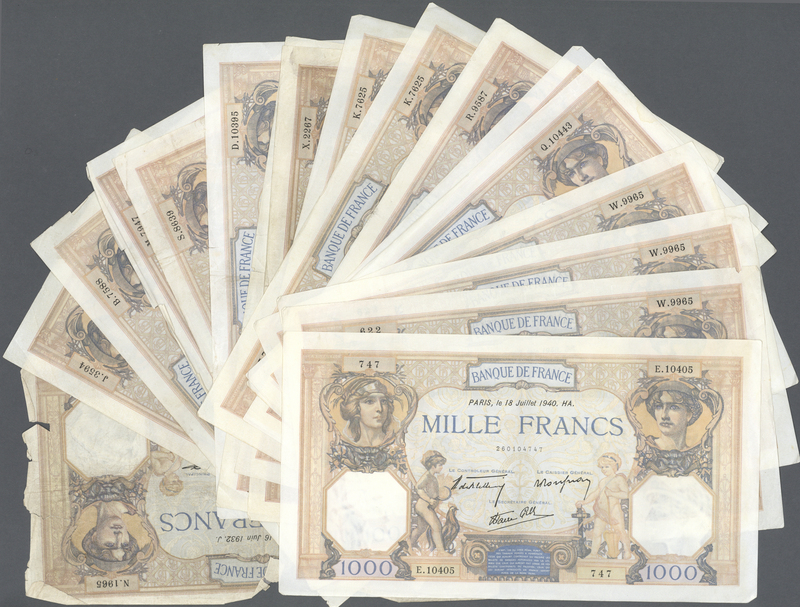 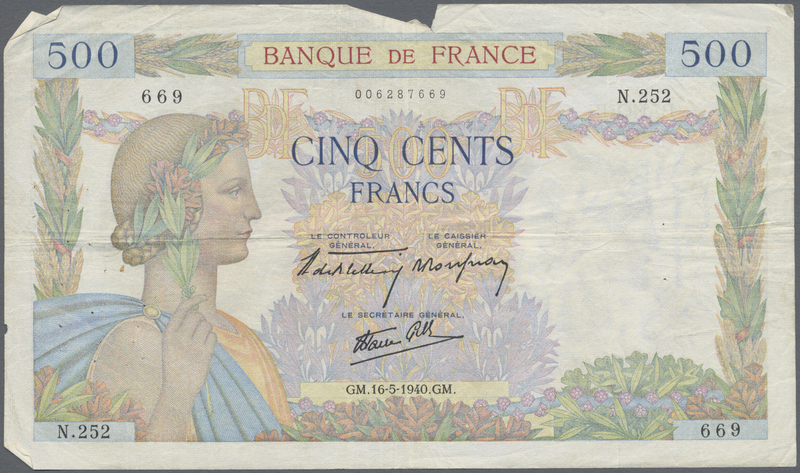 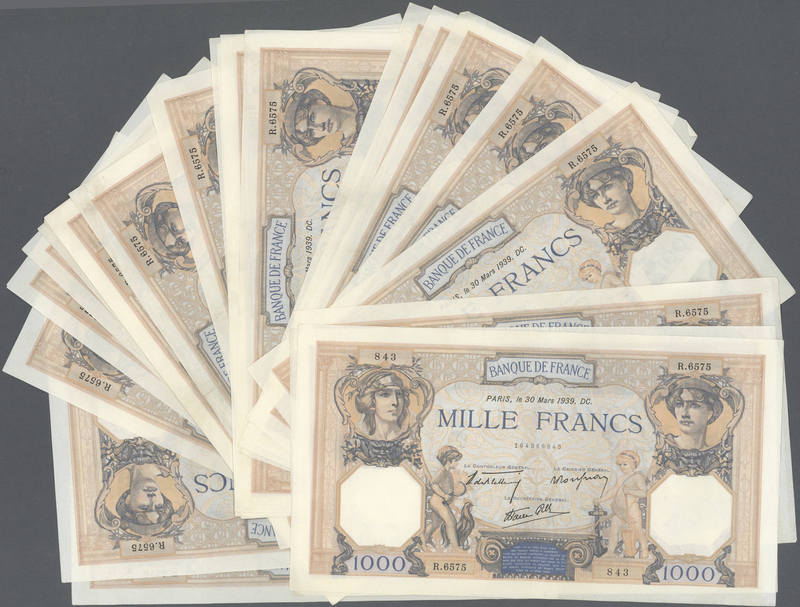 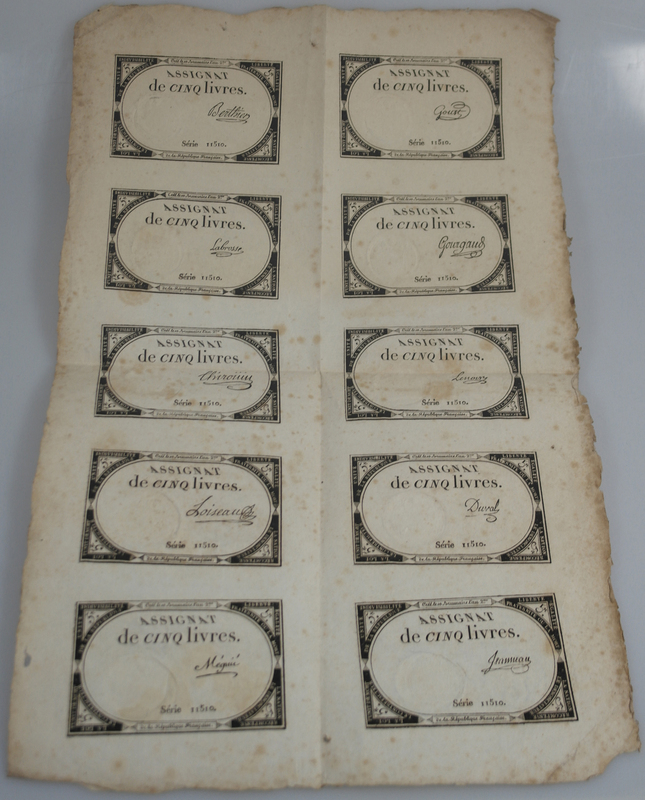 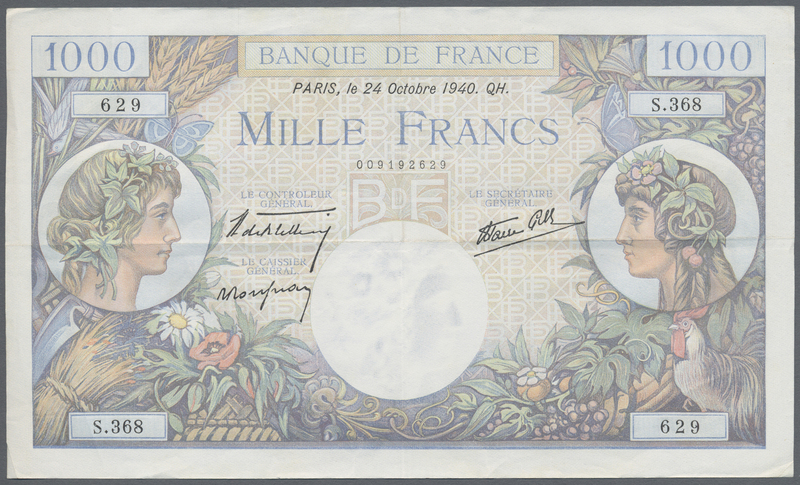 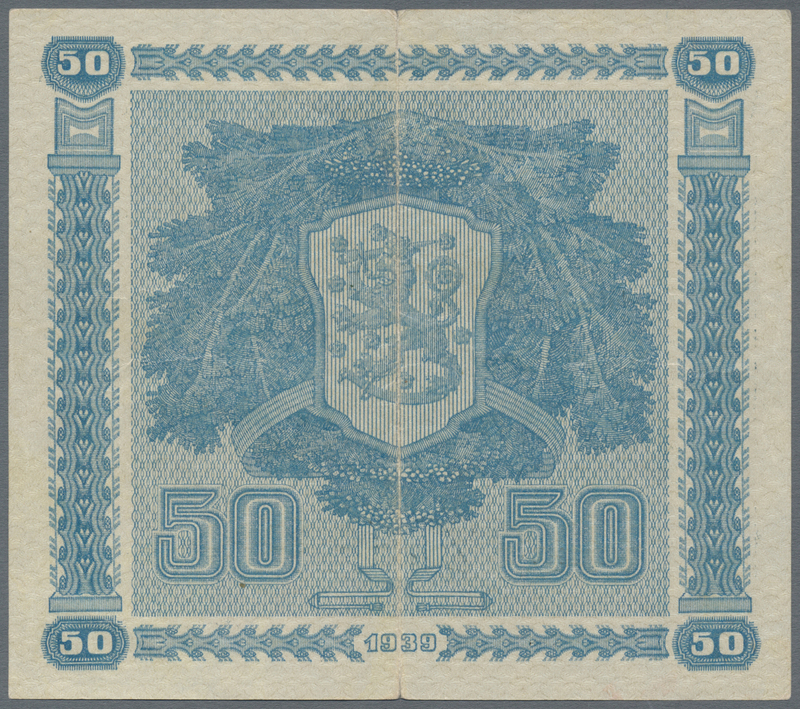 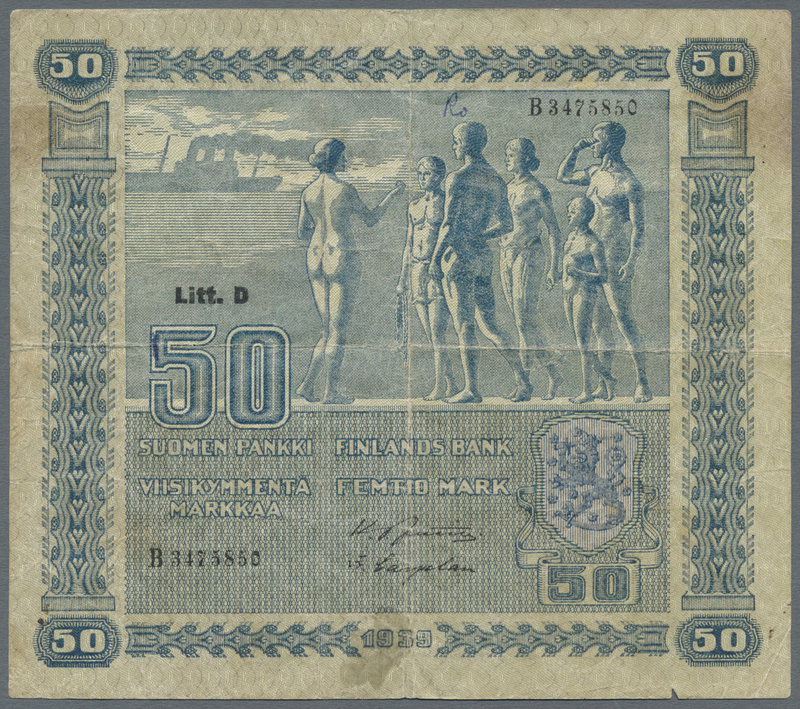 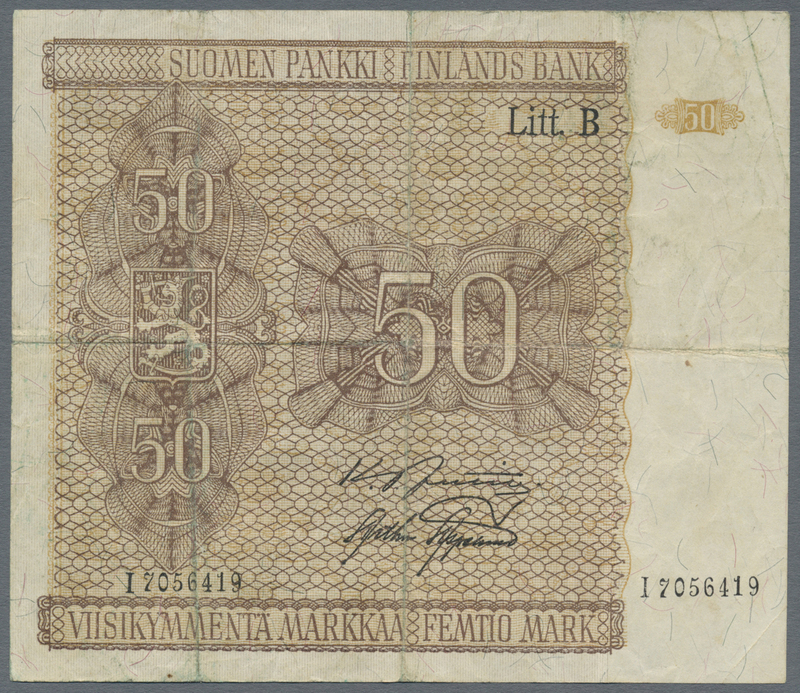 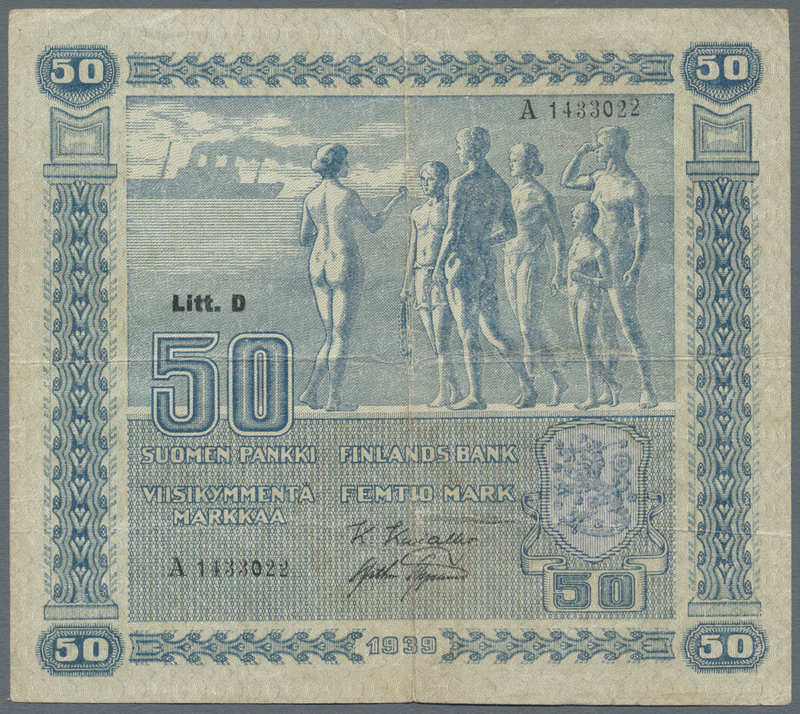 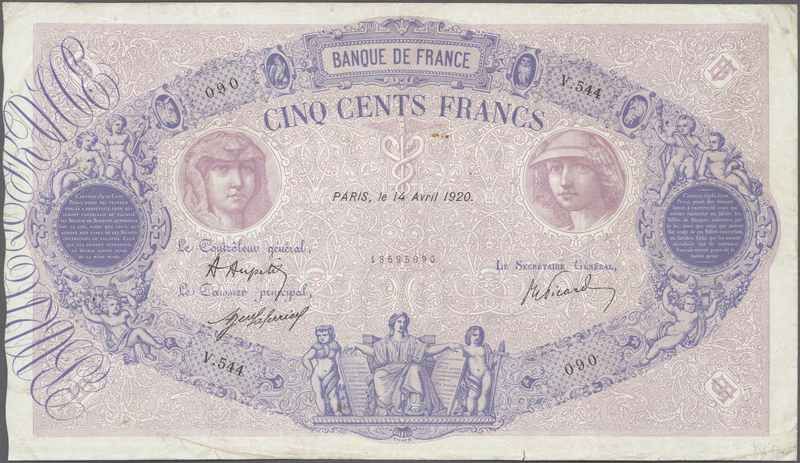 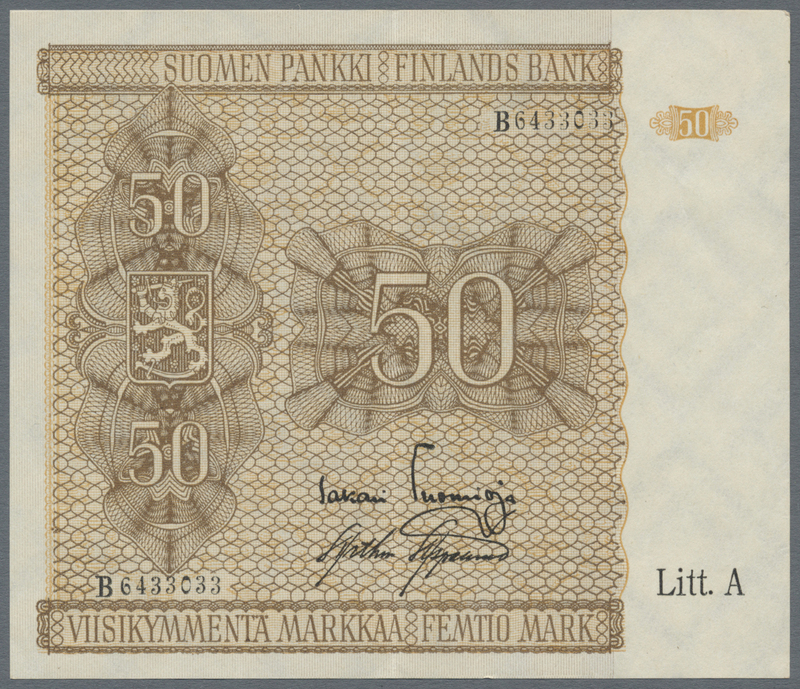 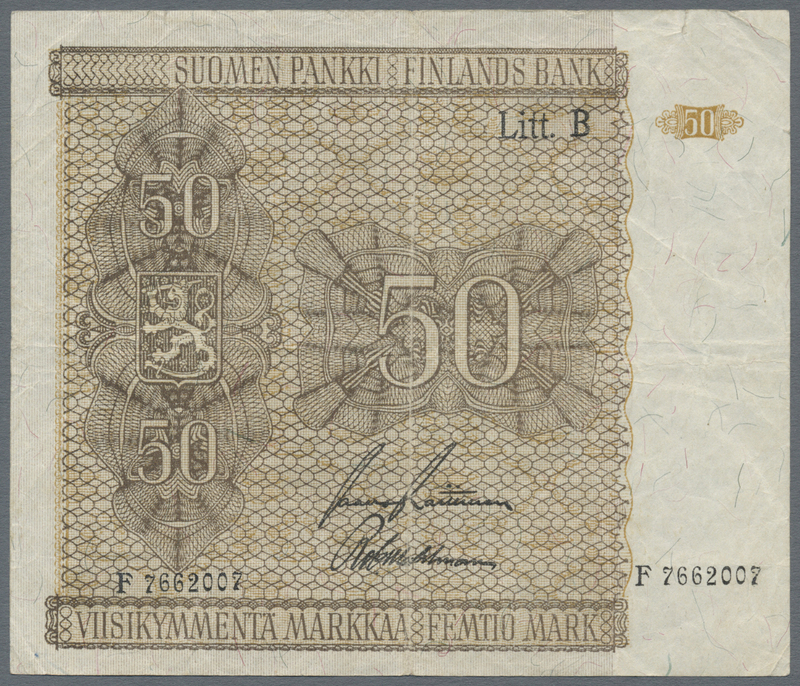 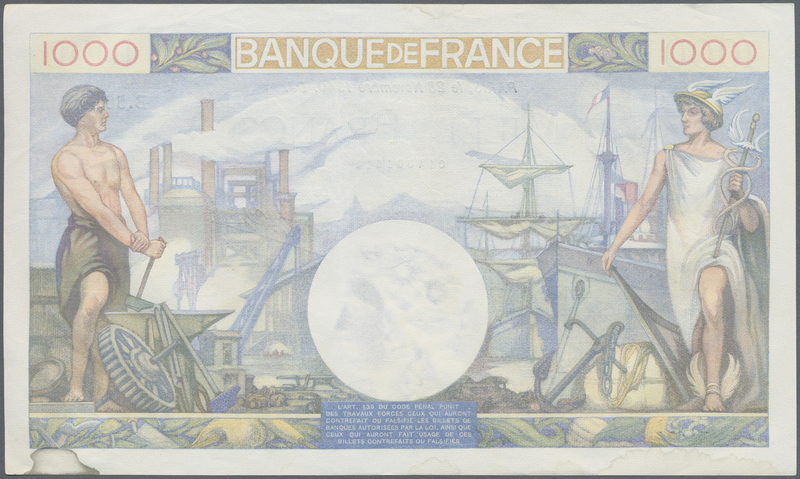 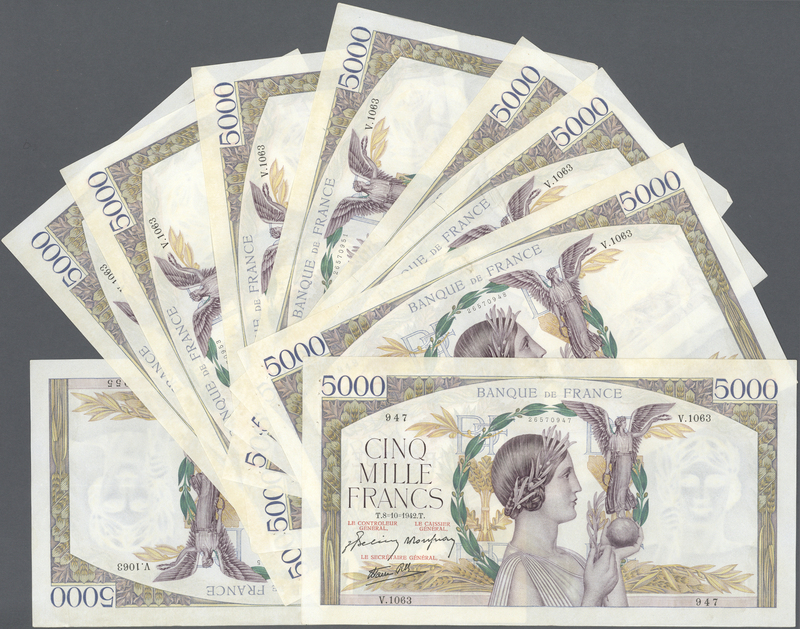 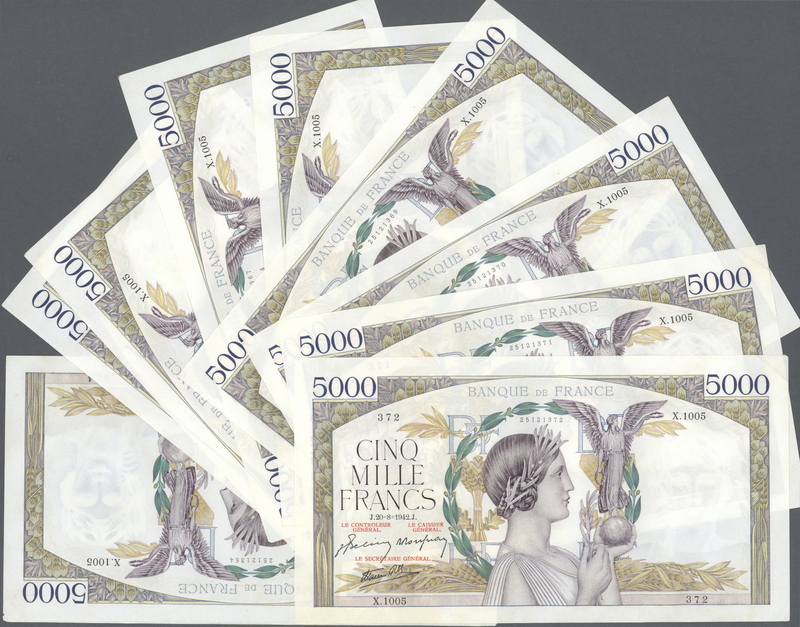 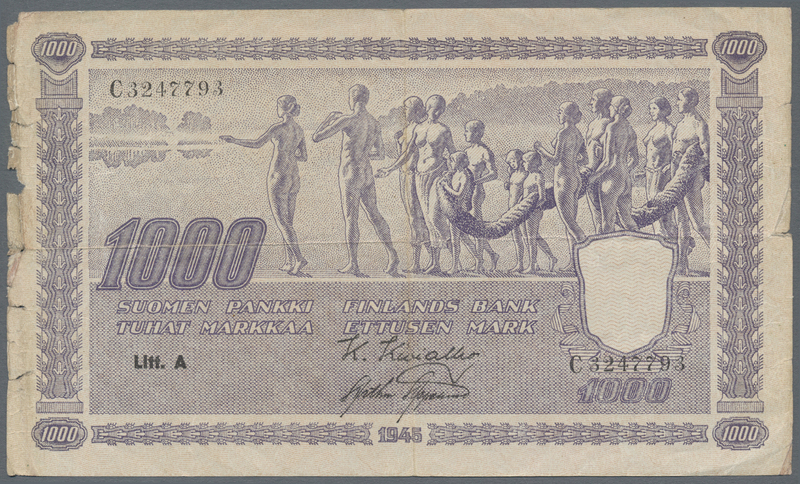 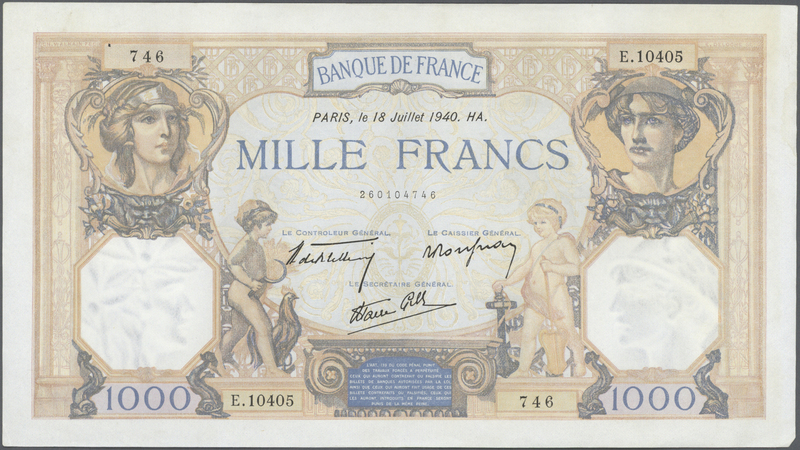 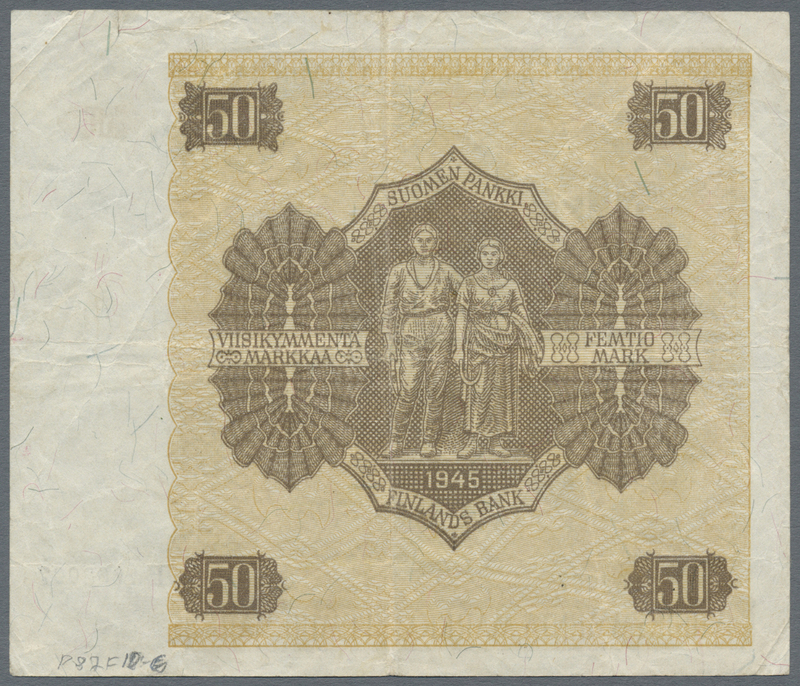 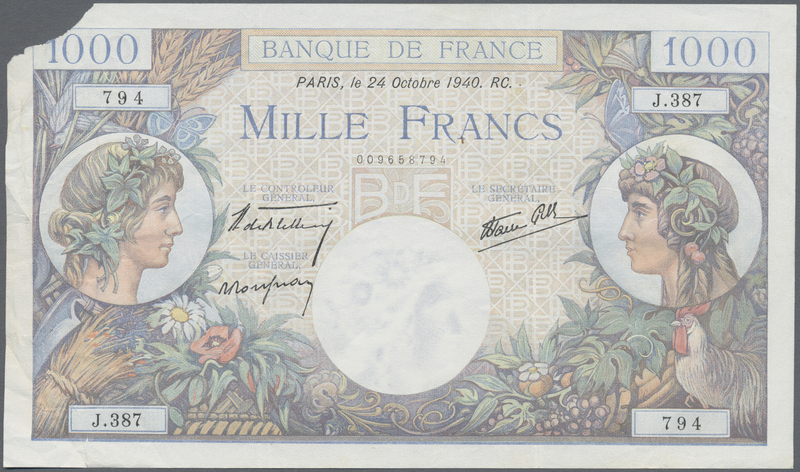 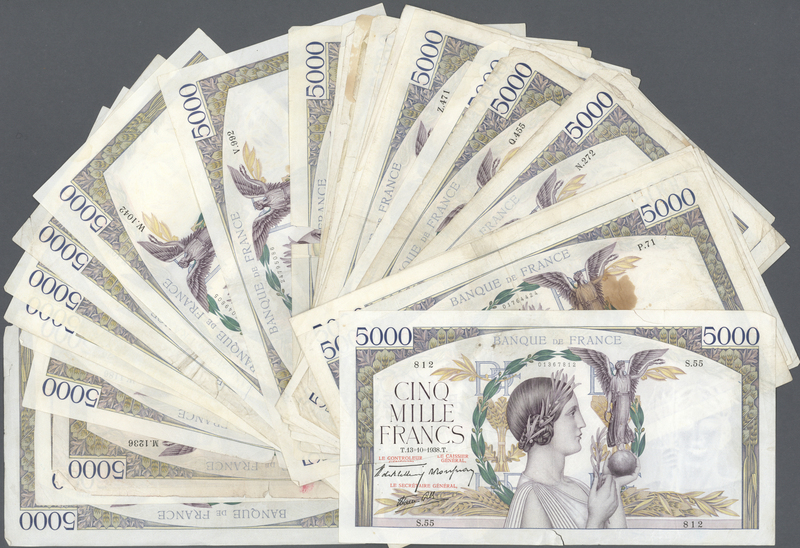 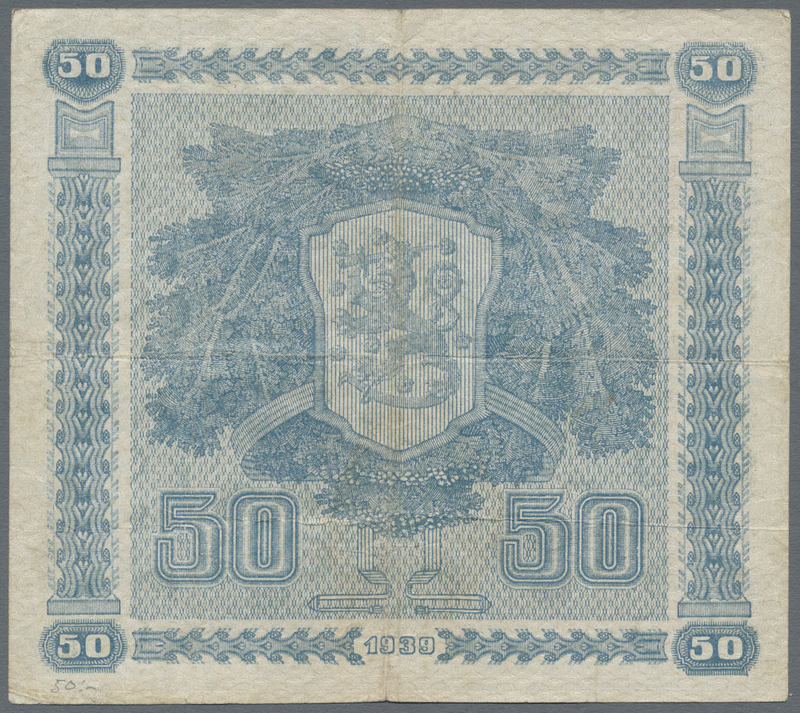 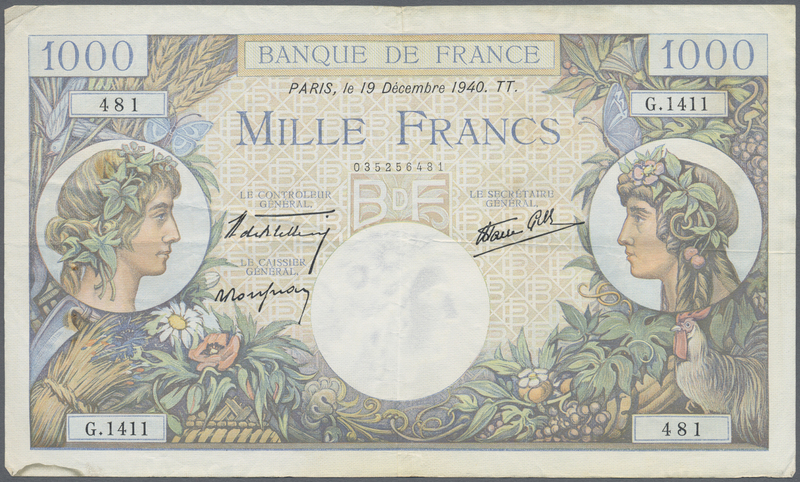 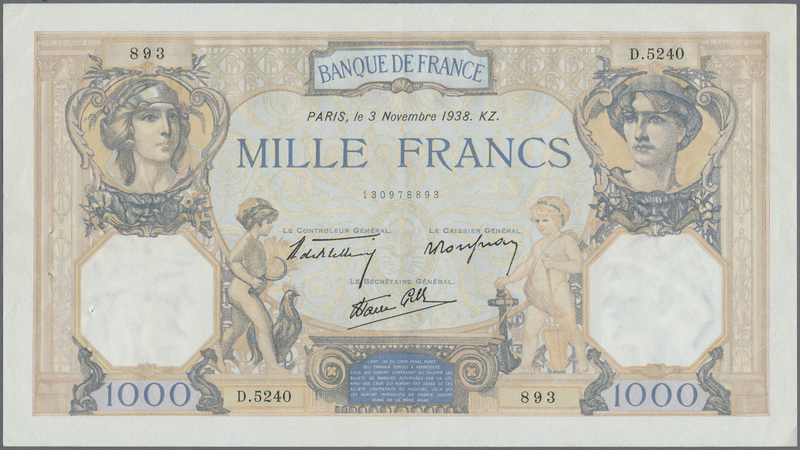 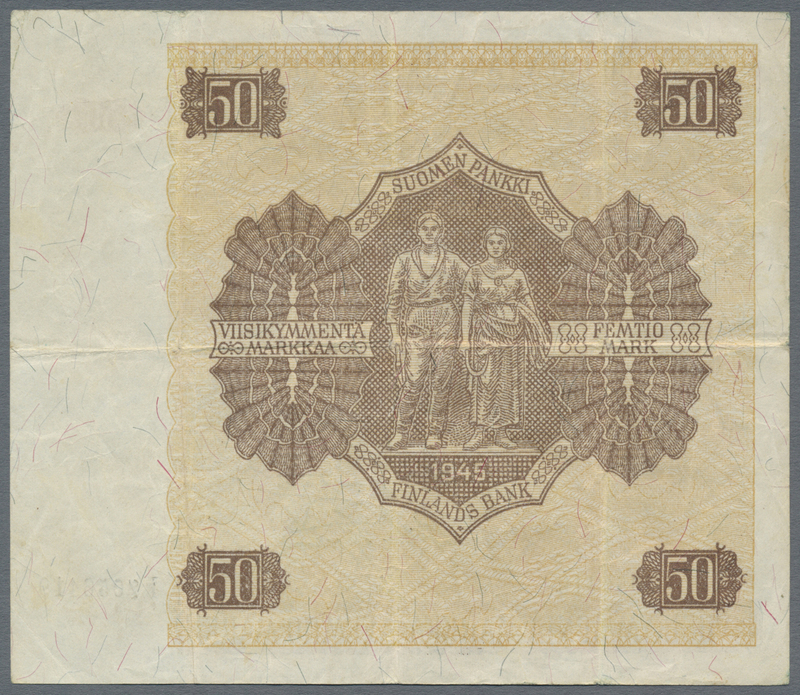 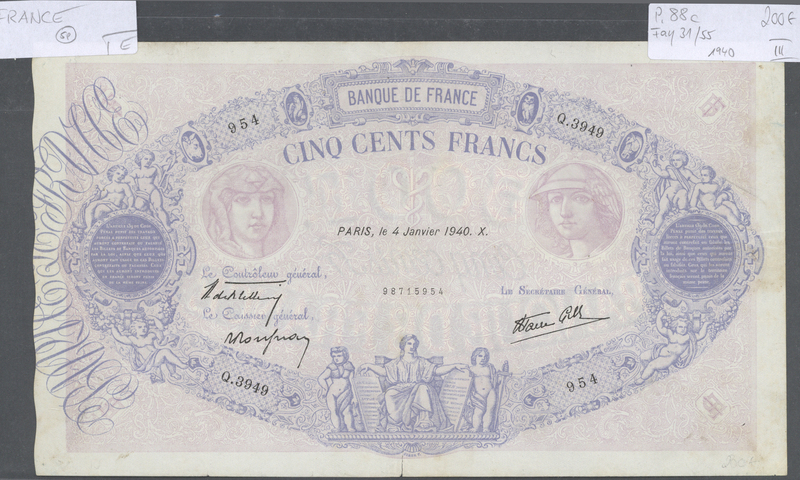 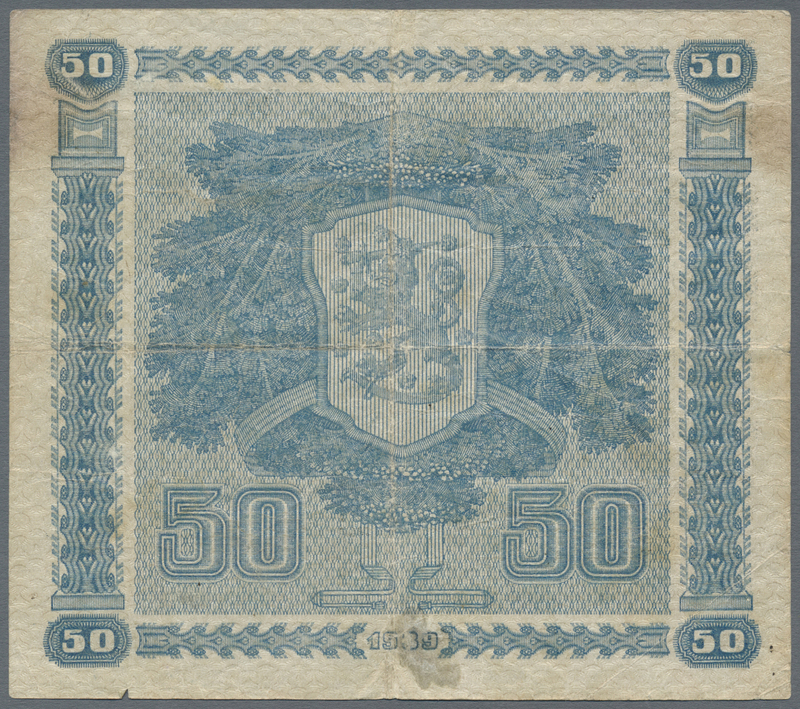 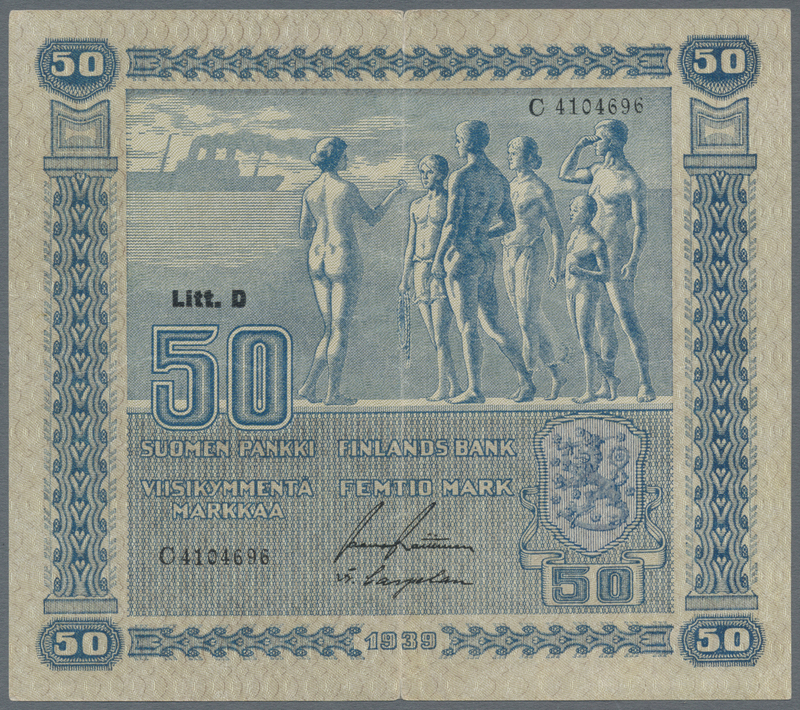 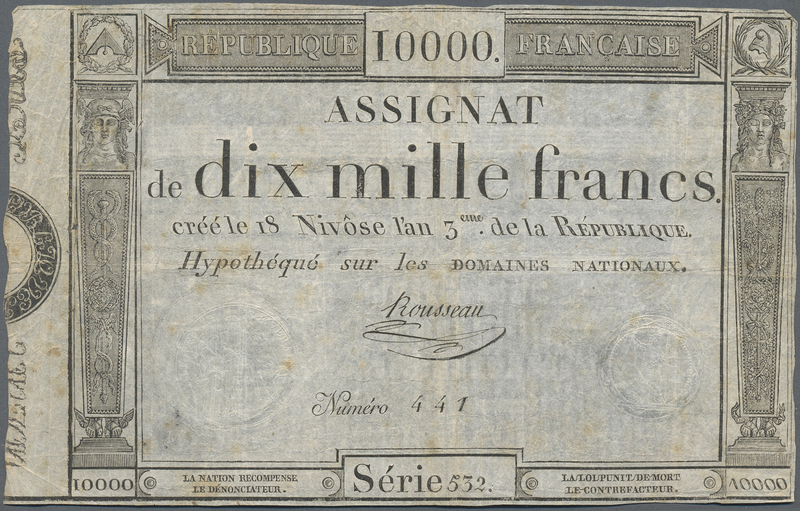 1439 Pick 66 500 Francs 1936 P. 66, used with folds, minor pinholes, pressed but no tears, no repairs, still strong paper with crispness and nice original colors, condition: pressed VF+, optically appears XF+. 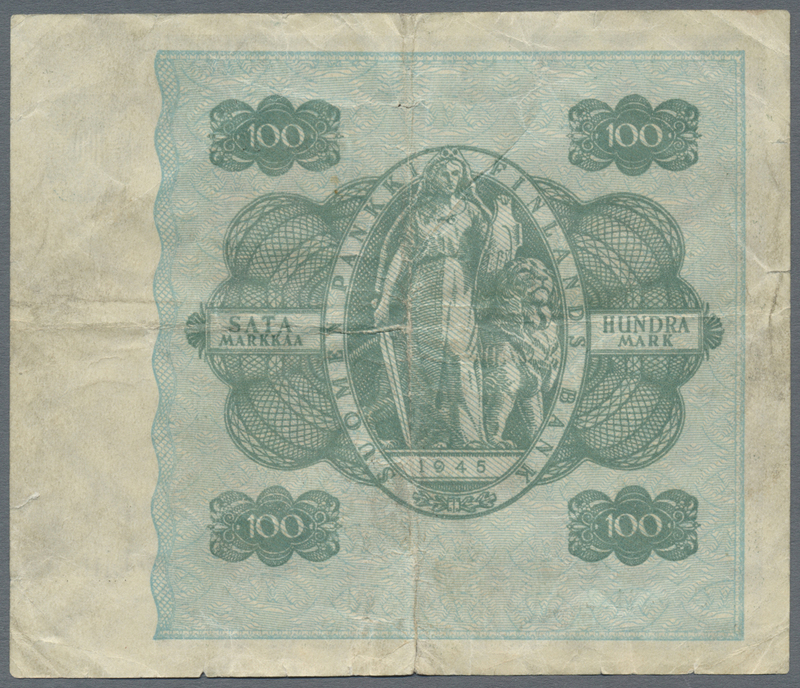 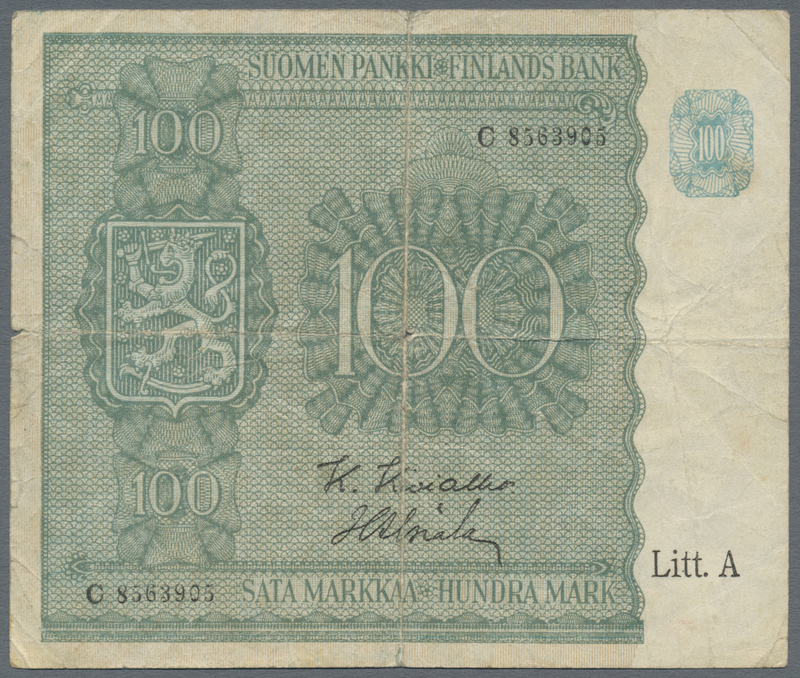 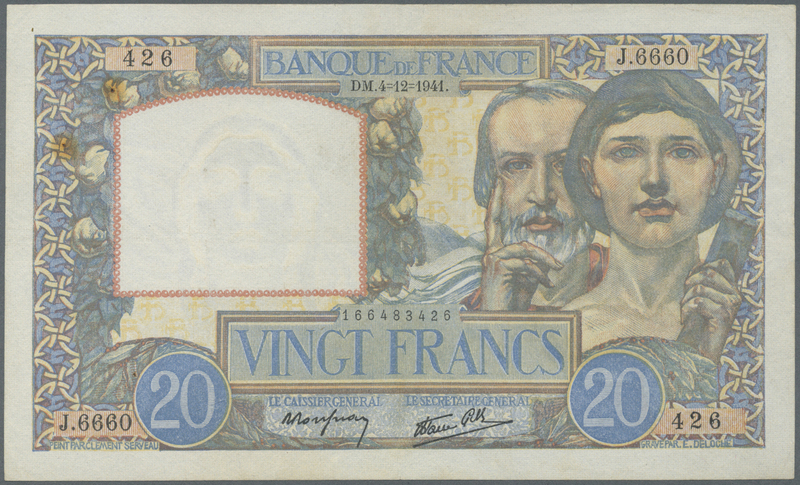 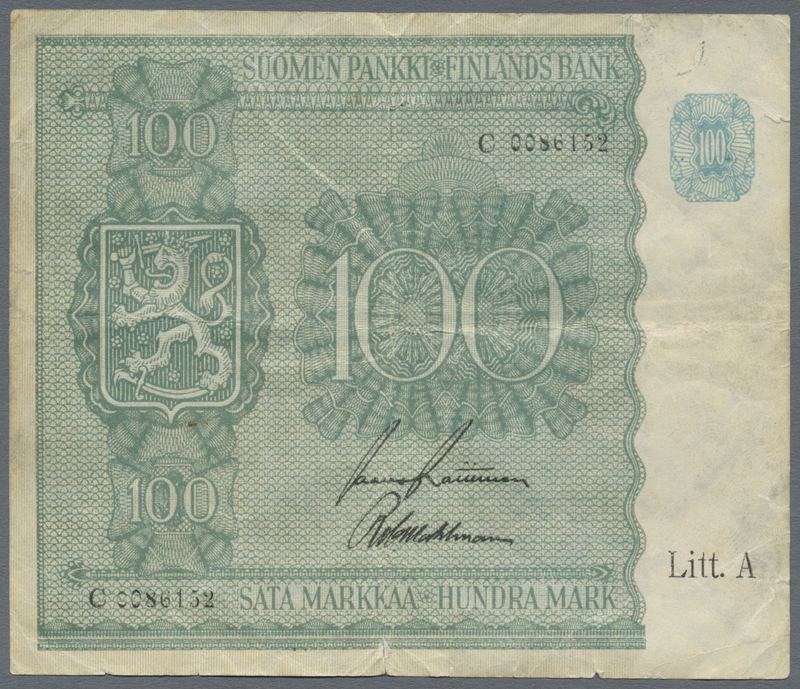 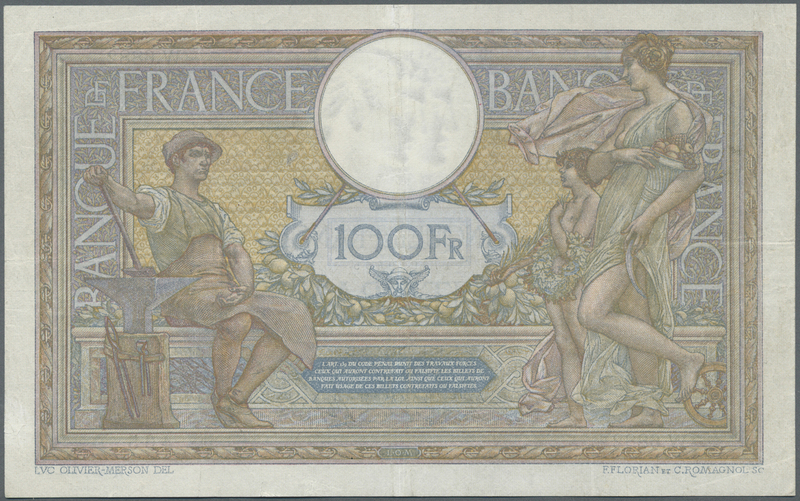 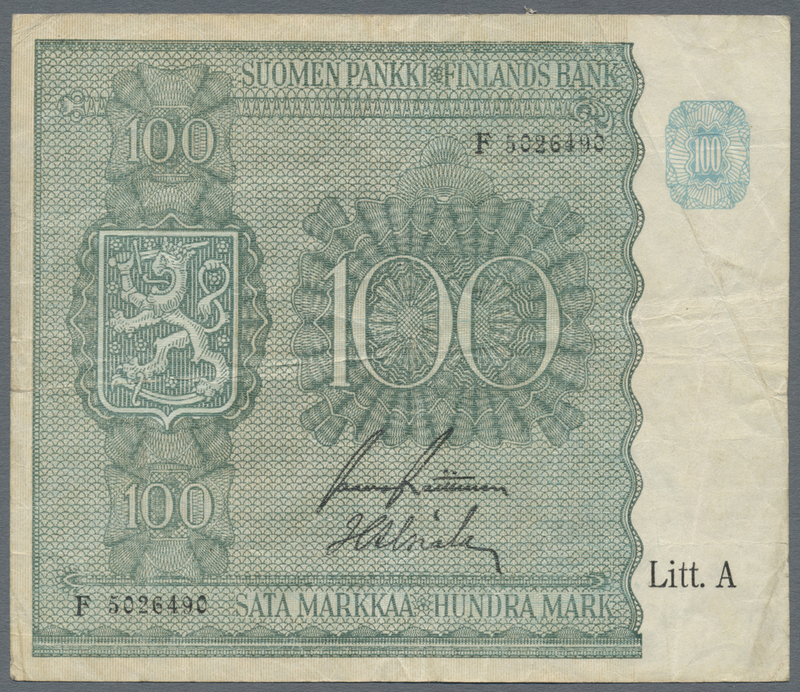 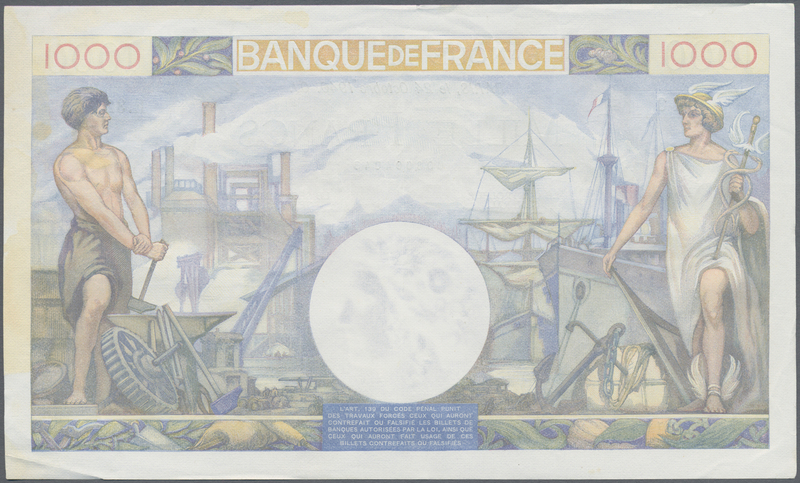 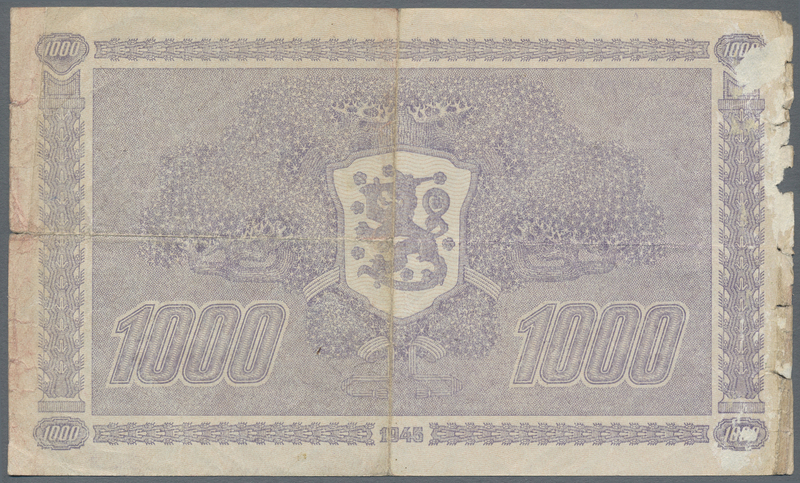 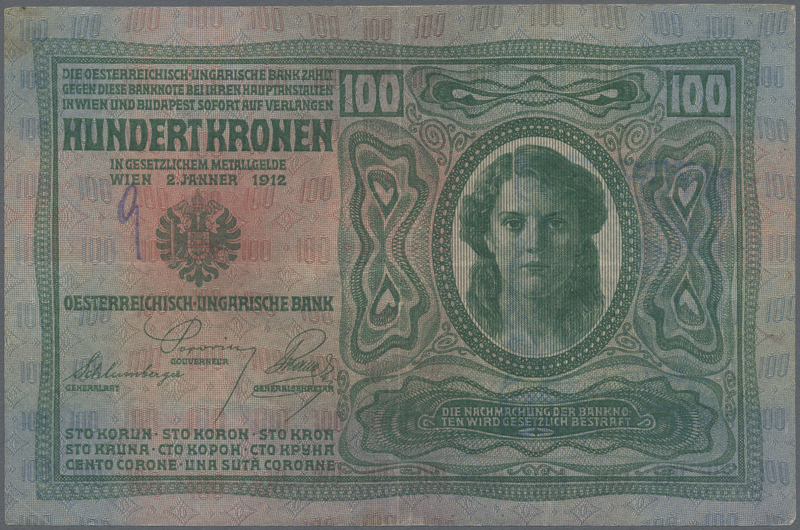 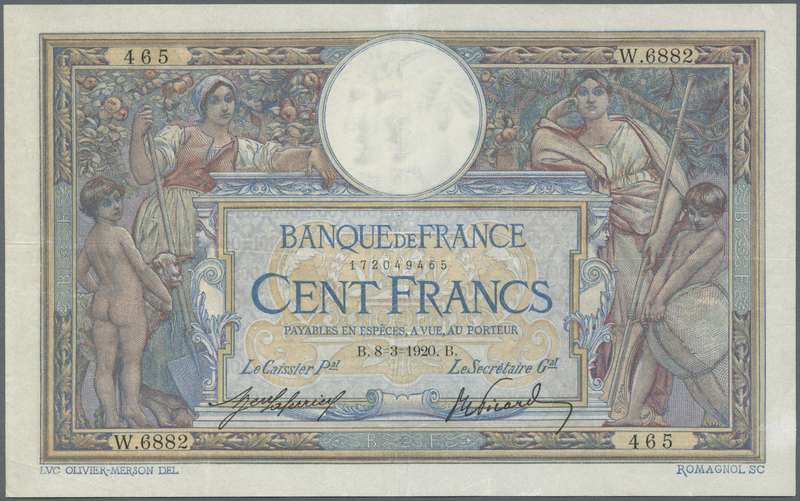 1442 Pick 71a 100 Francs 1920 P. 71a, with earlier date, paper still with crispness and pretty clean, obviously pressed, 2 pinholes, 2 minor restored tears at borders, still original colors, folds in paper, condition: F (optically appears VF or better). 1443 Pick 76 rare and beautiful note 5000 Francs 1918 "FLAMENG" P. 76, with very crisp original paper and original colors, only 2 pinholes, light stain trace at lower right, minor split at lower right restored; furthermore a professionaly restored major tear in center (from lower border up to 2/3rd of the note) which is only visible when you hold the note against the light. 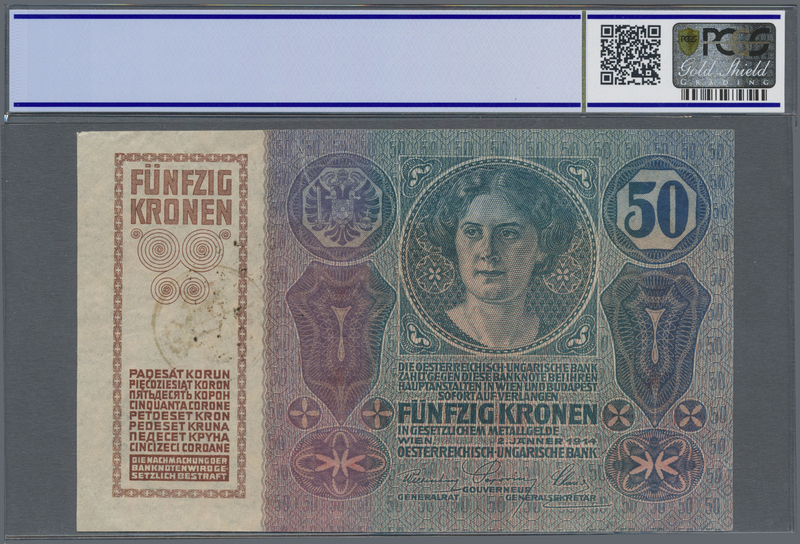 Otherwise sharp borders and not the usual border wear, very pretty note, condition is F because of the tear, but optically appears VF+ or better. 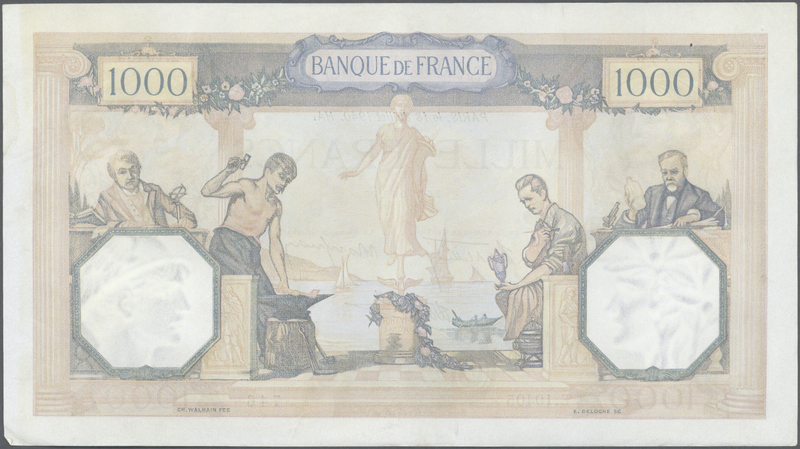 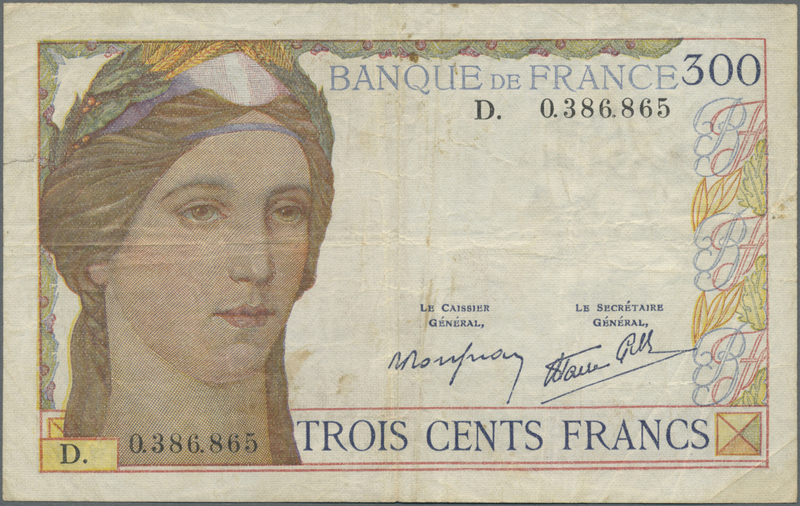 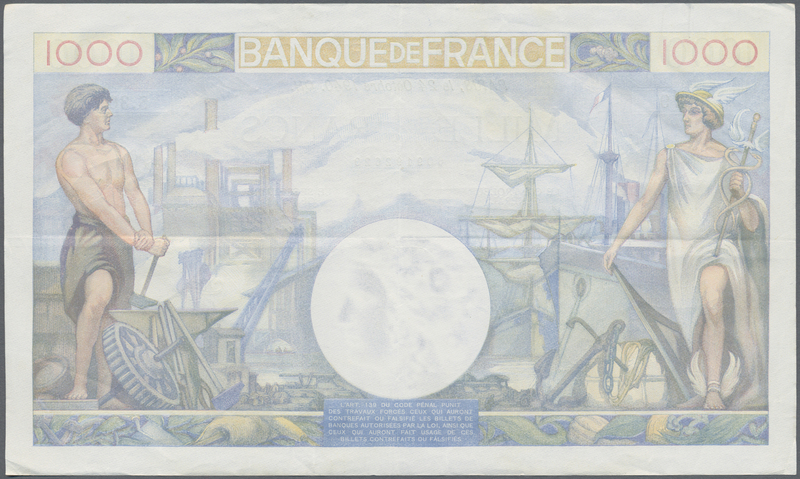 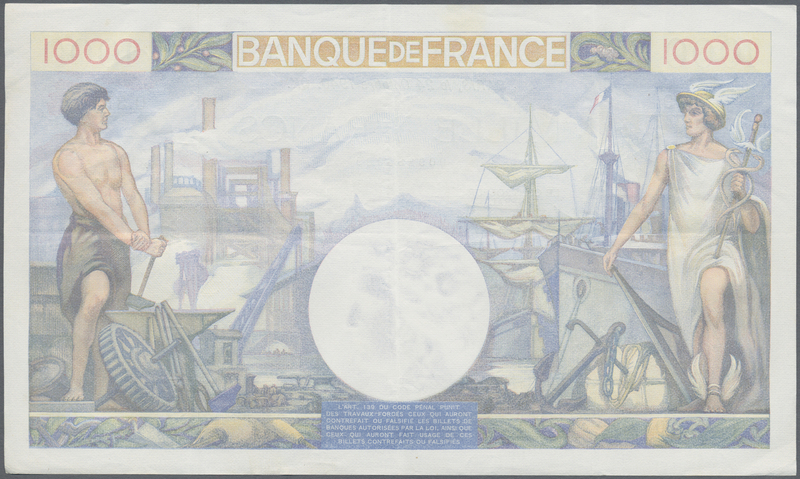 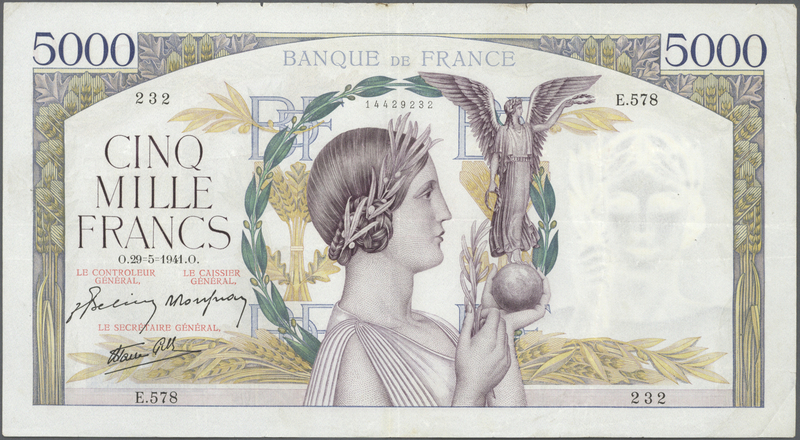 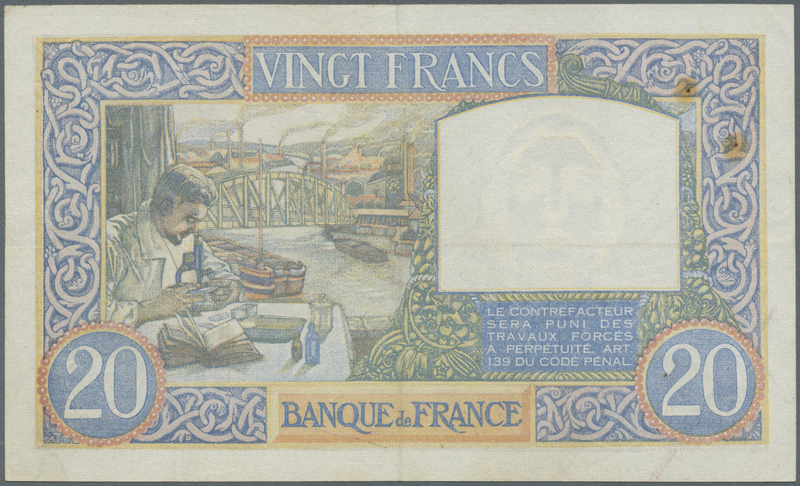 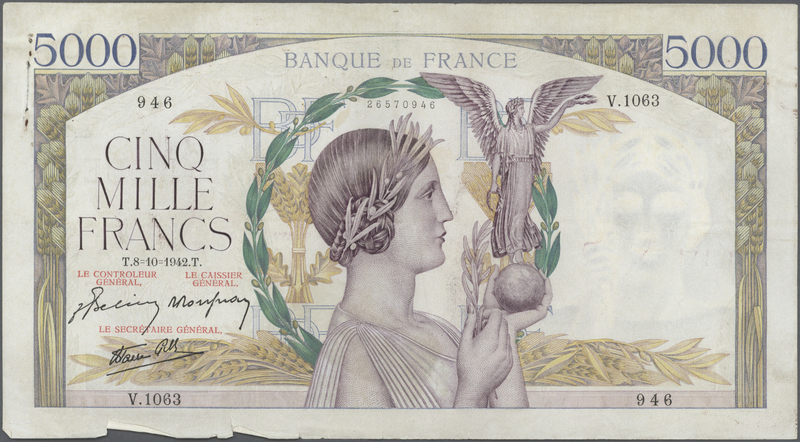 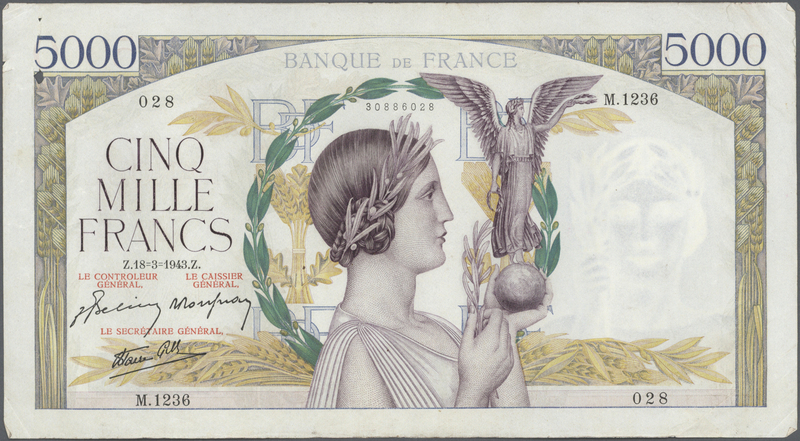 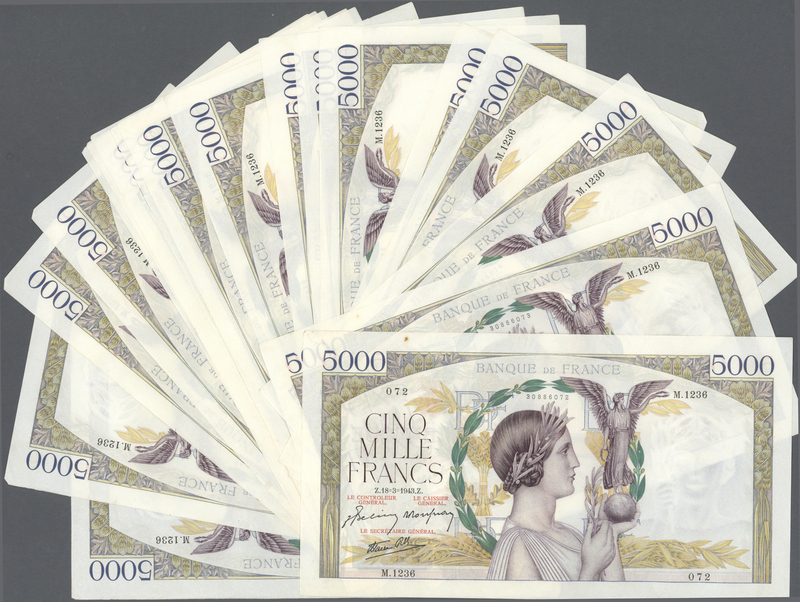 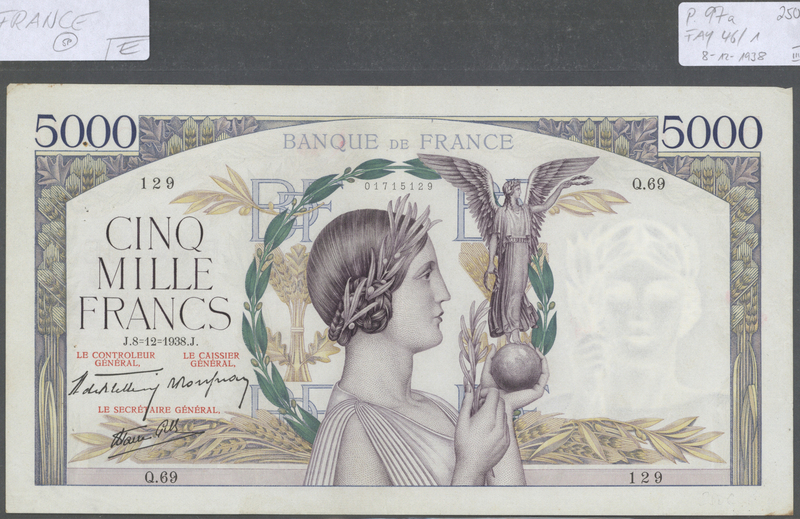 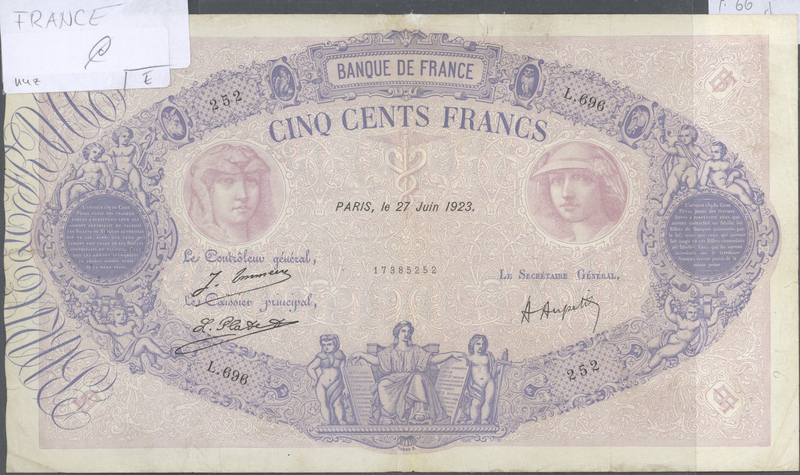 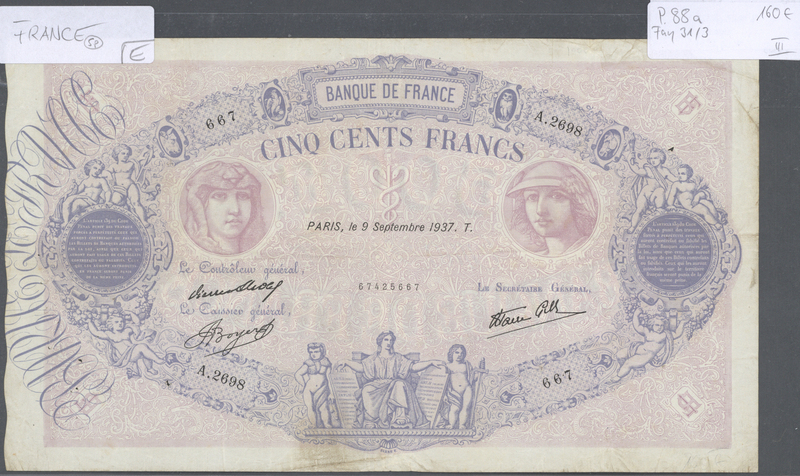 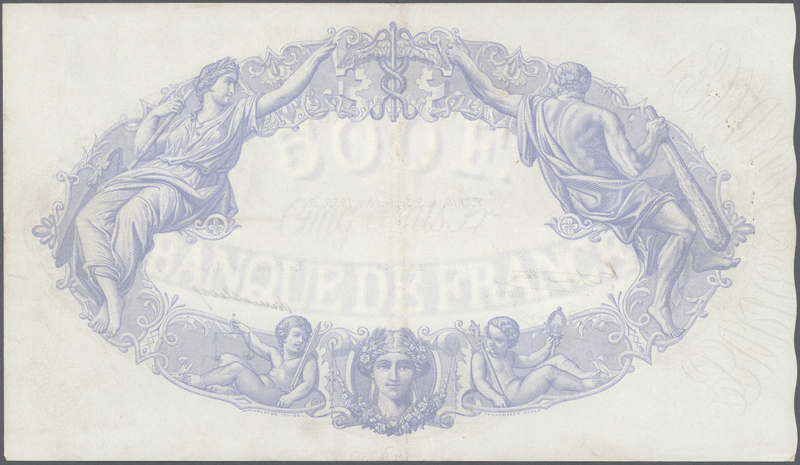 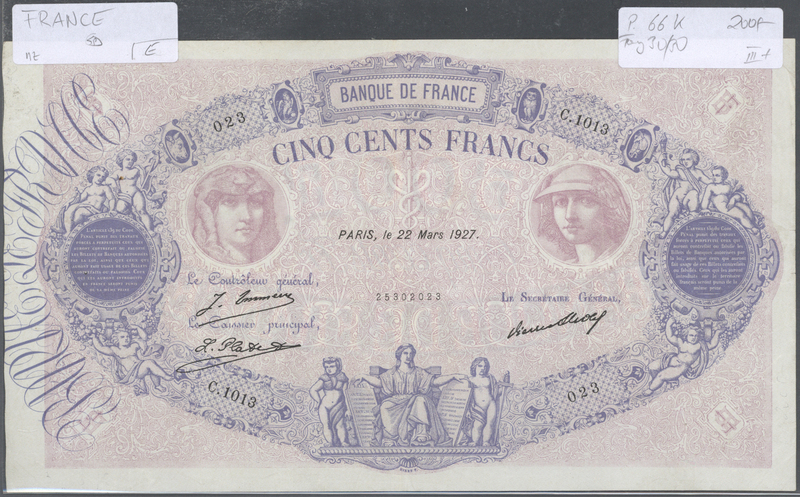 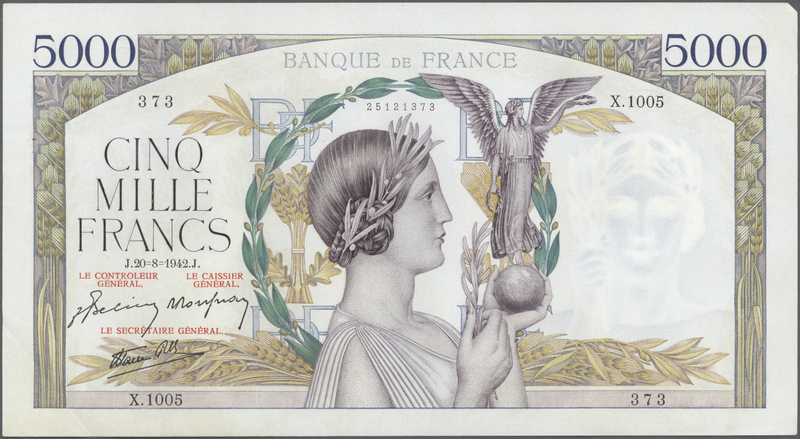 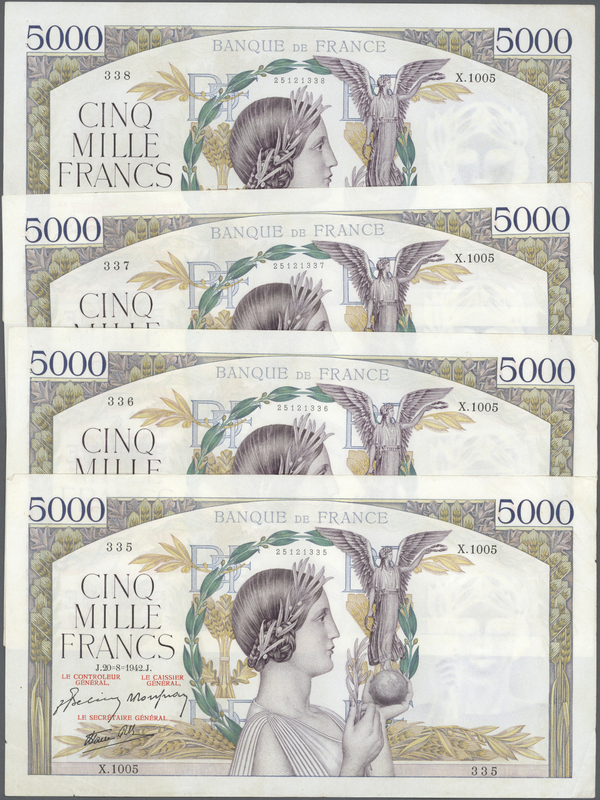 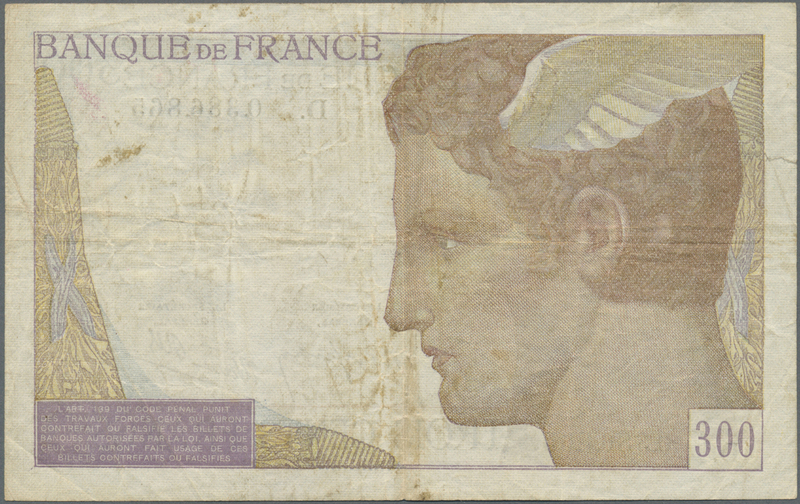 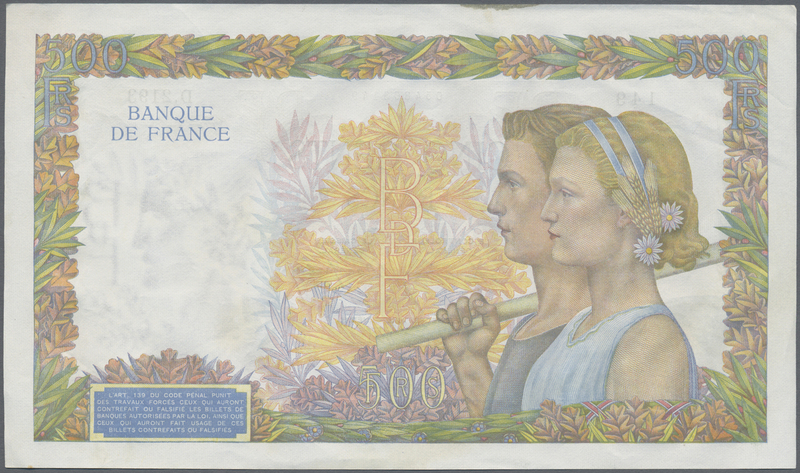 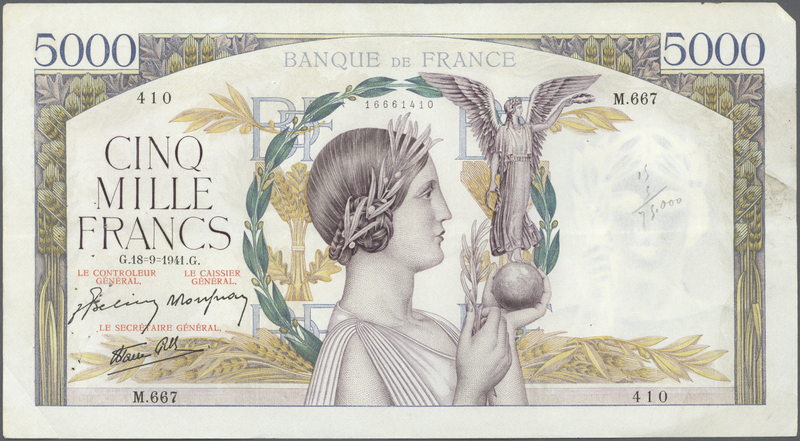 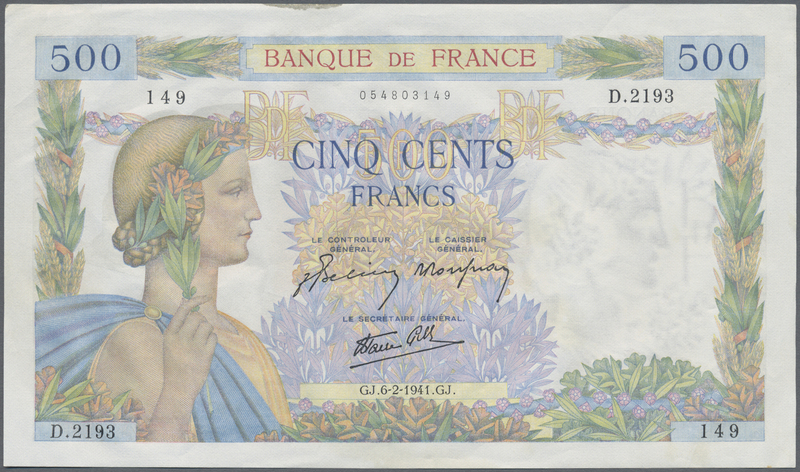 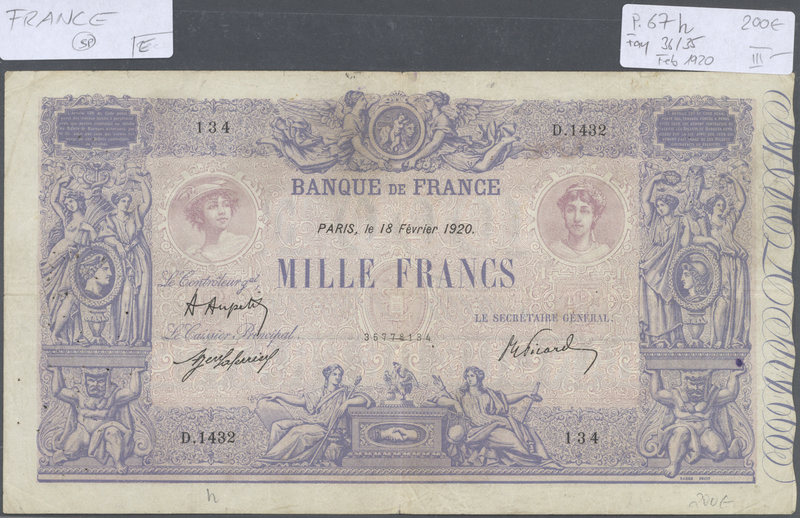 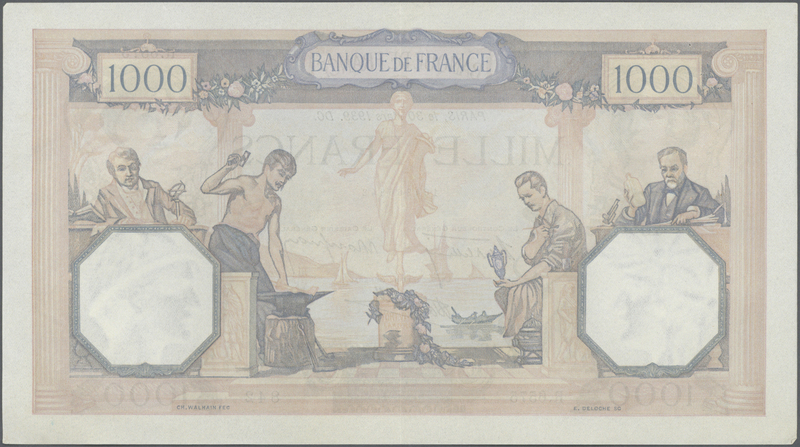 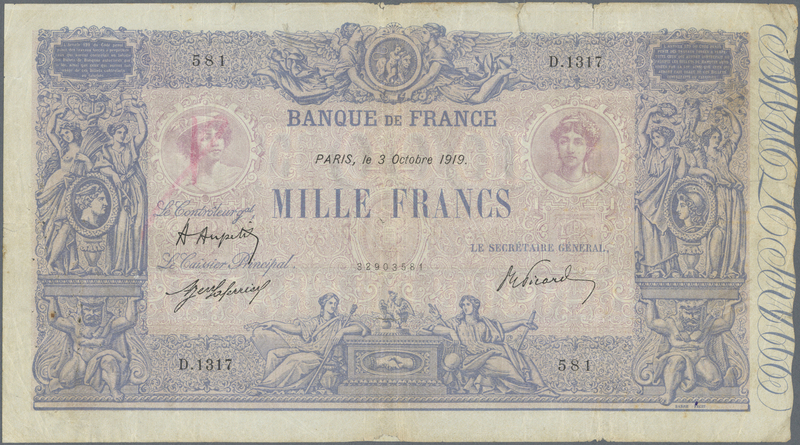 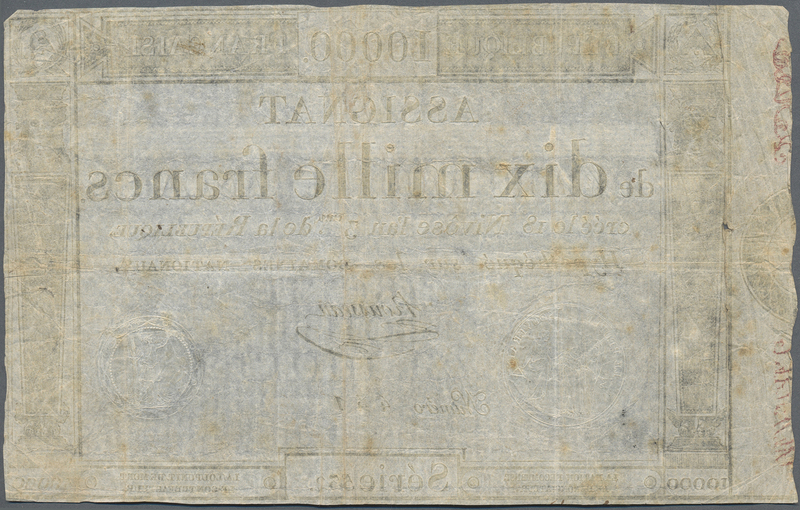 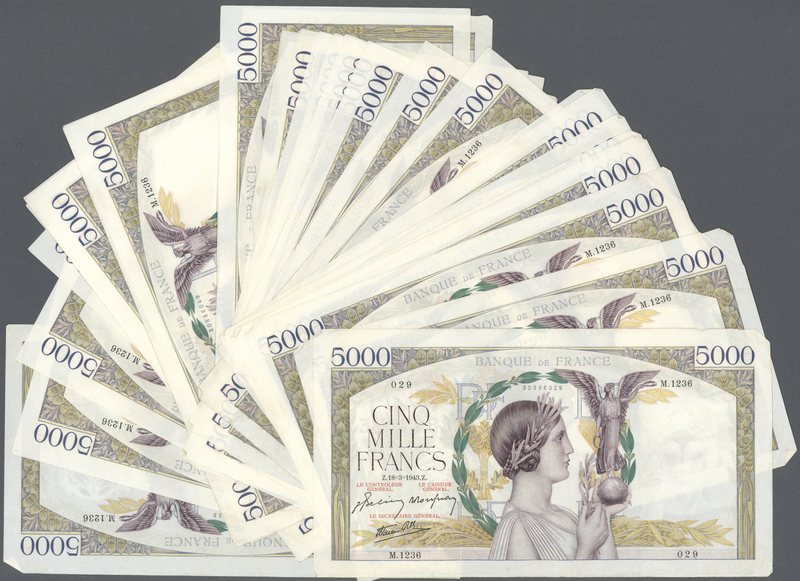 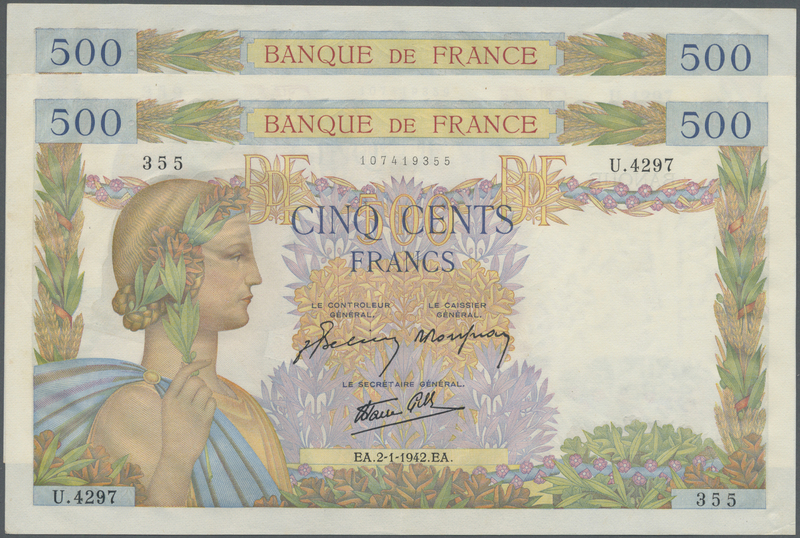 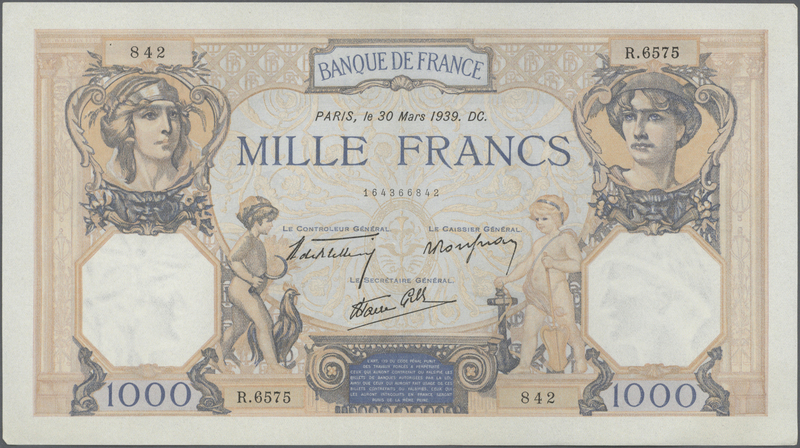 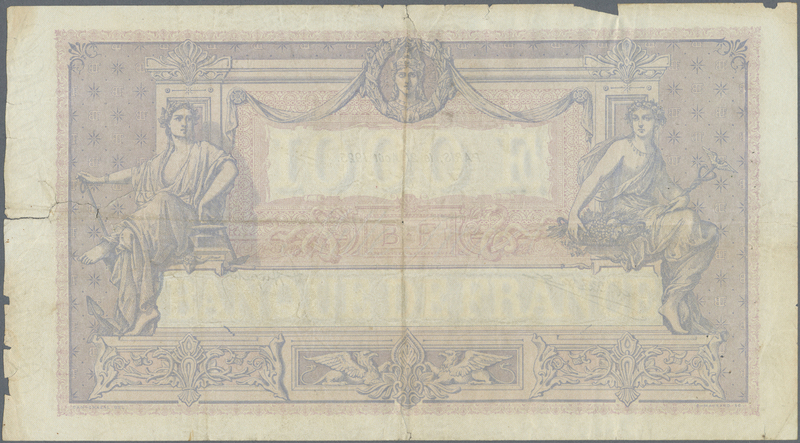 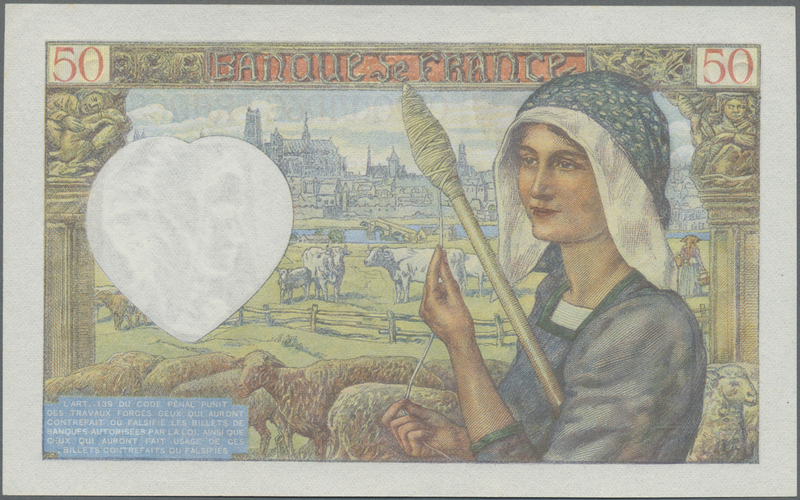 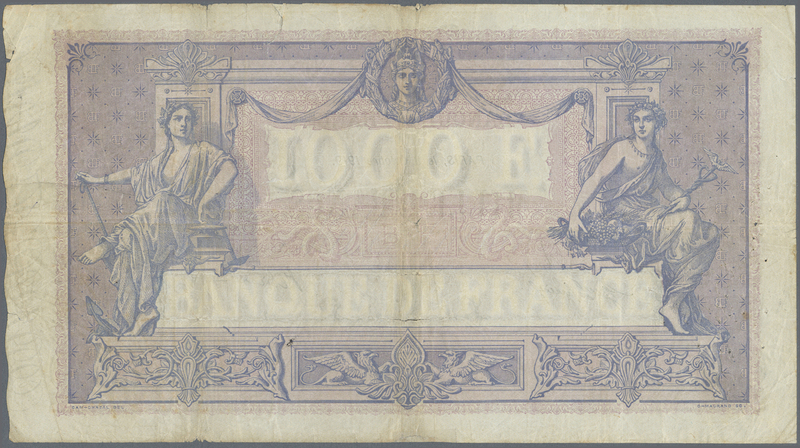 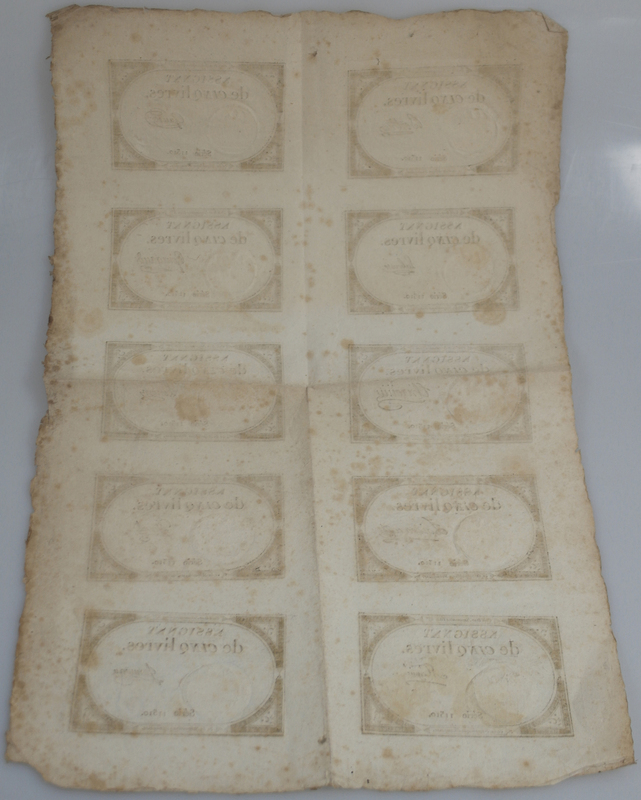 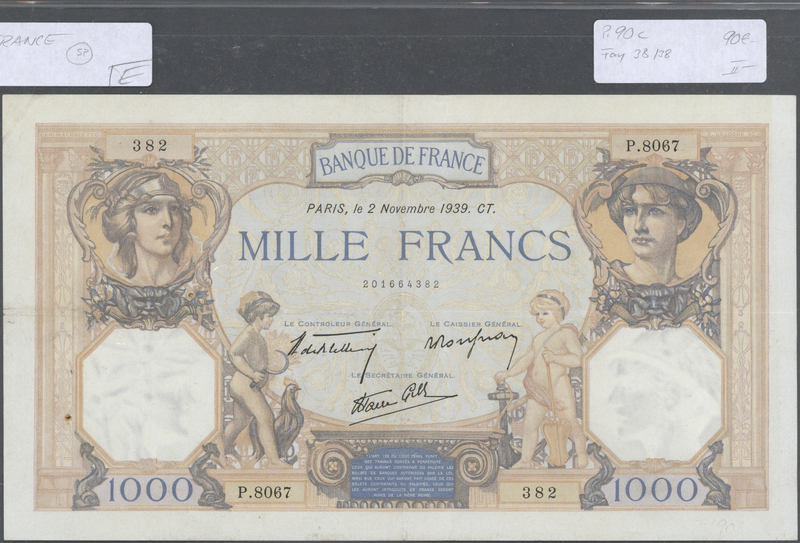 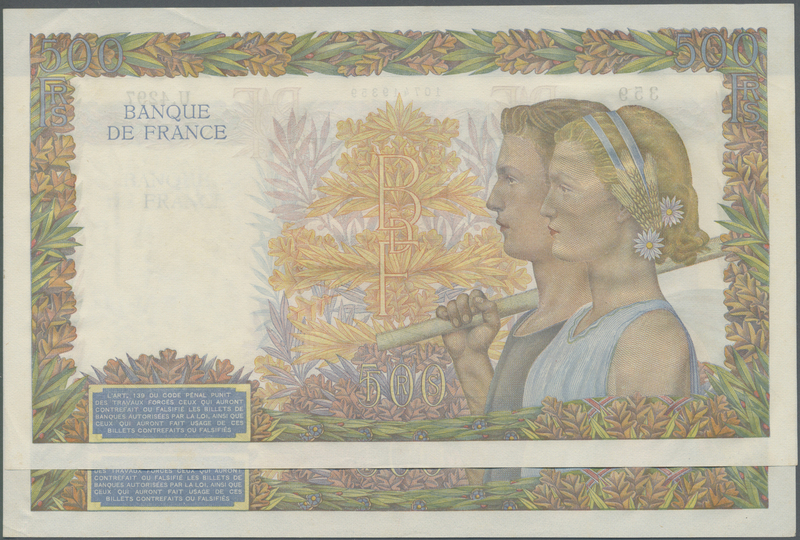 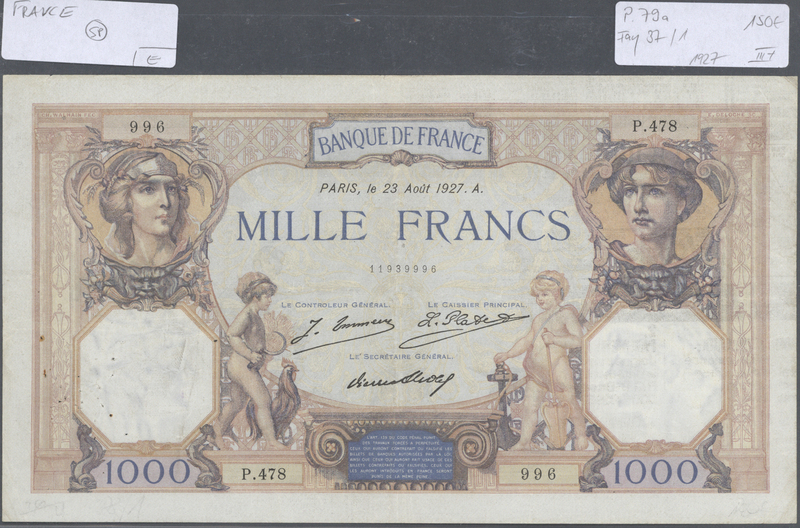 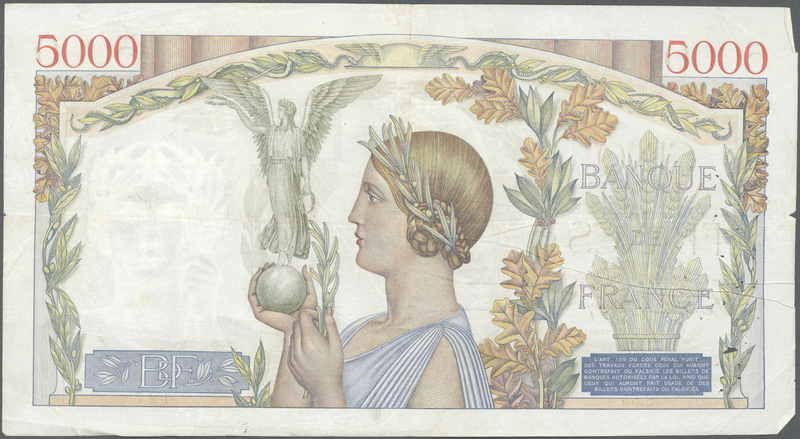 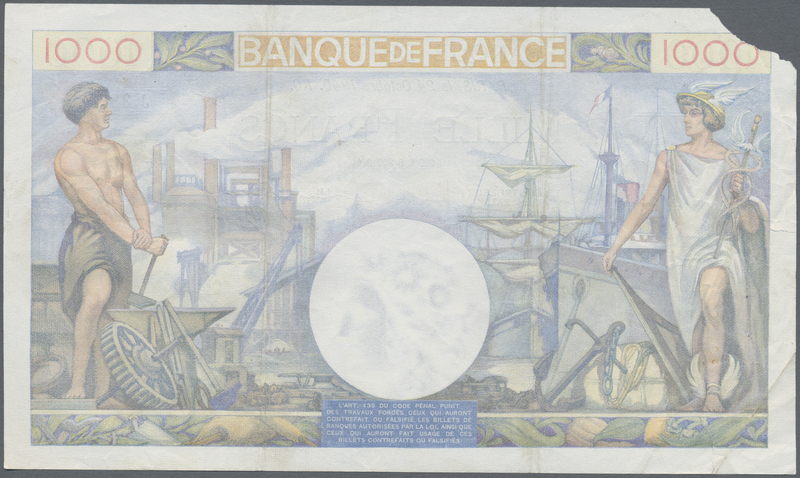 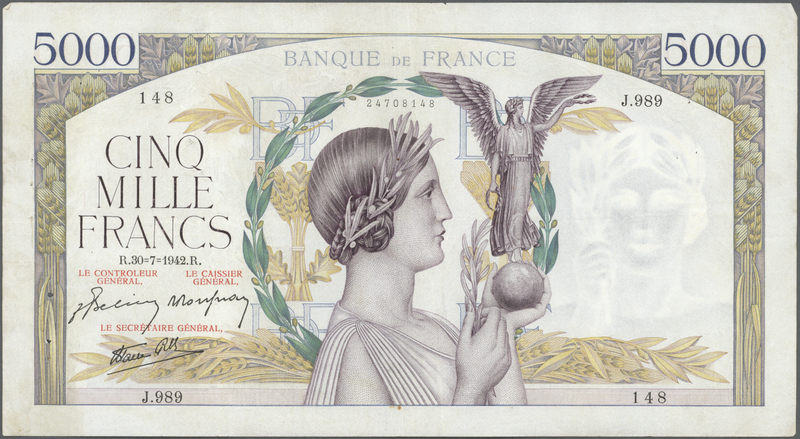 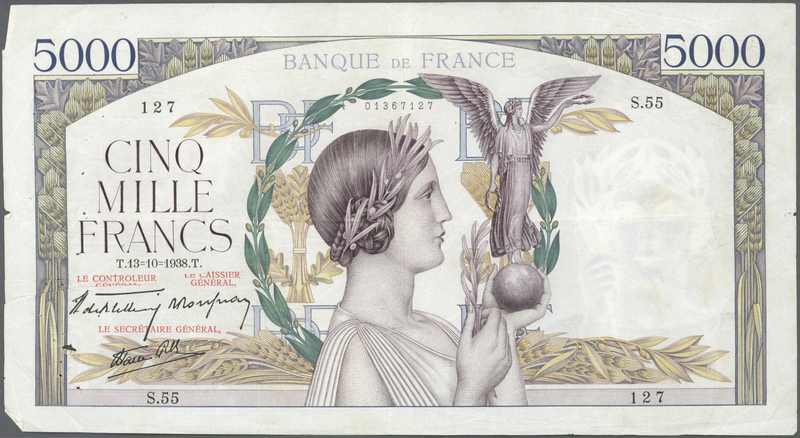 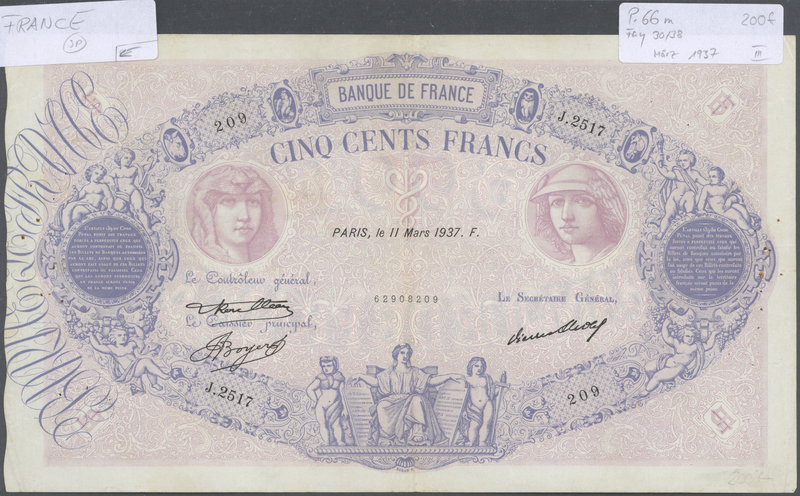 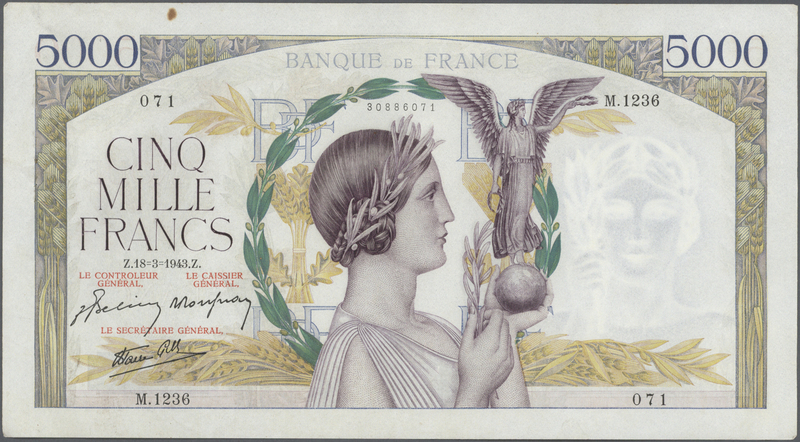 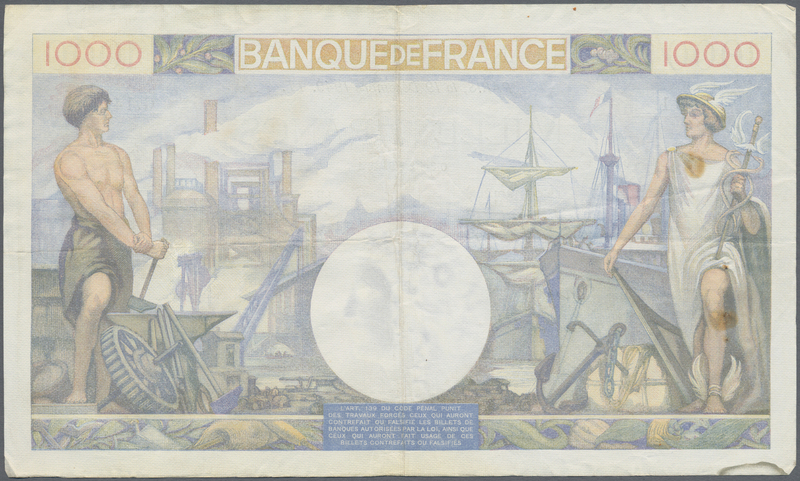 1444 Pick 85 300 Francs ND P. 85, one of the key notes of french banknote collecting, normal traces of use like folds and light stain traces in paper, one 5mm border tear, no holes, paper still strong and with original colors, condition: F+. 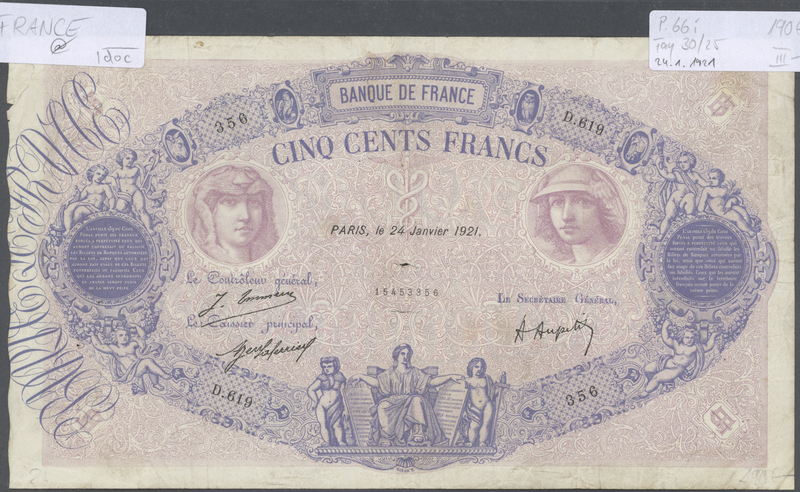 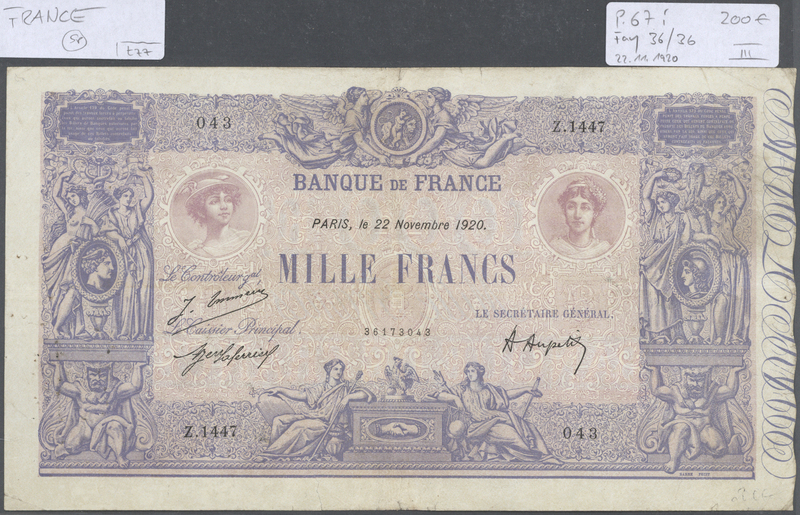 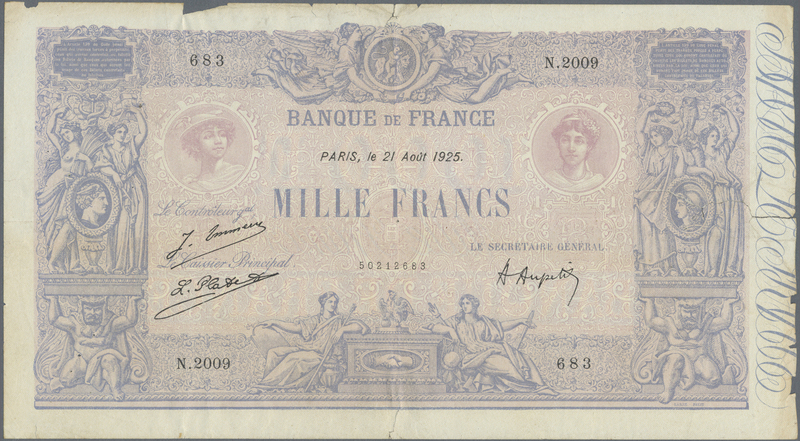 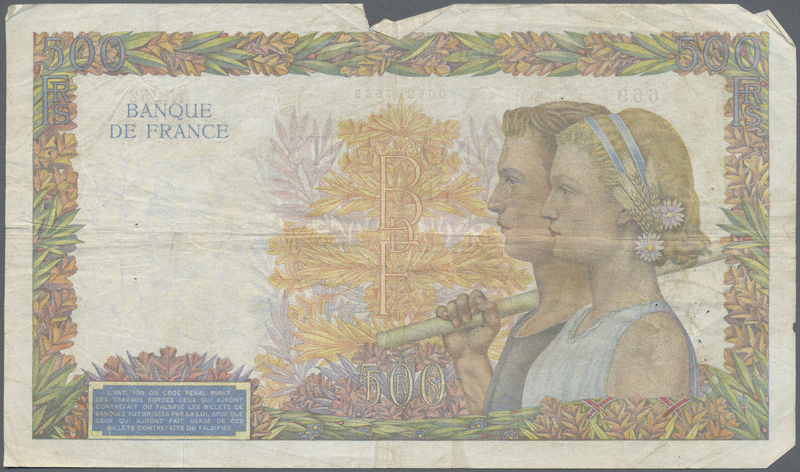 1447 Pick 92b 20 Francs 04.12.1941 P. 92b, light folds in paper, washed and pressed even it would not have been necessary because the note is still in nice condition with only a few usual pinholes, 2 minor border tears but still nice original colors and strong paper, condition: F+, optically appears VF or better. 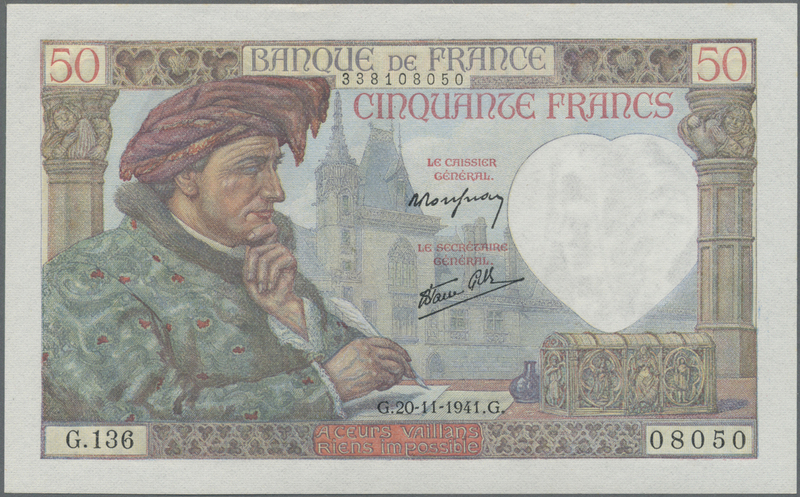 1448 Pick 93 50 Francs 1941 P. 93 in crisp original condition with great embossing of the print in paper, no holes or tears, condition: UNC.